Clive Cussler writes great books, and he owns great cars. 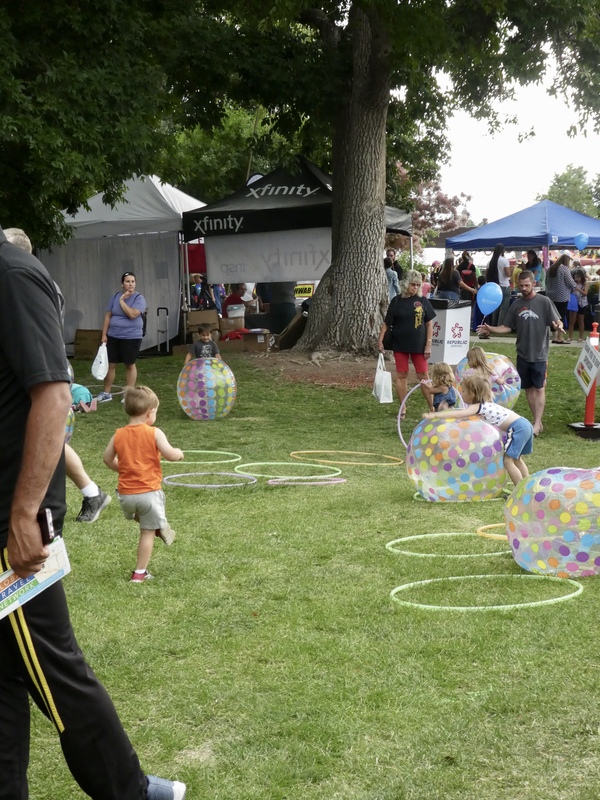 At one time in his life, Clive Cussler, lived in Arvada, Colorado, near Denver. 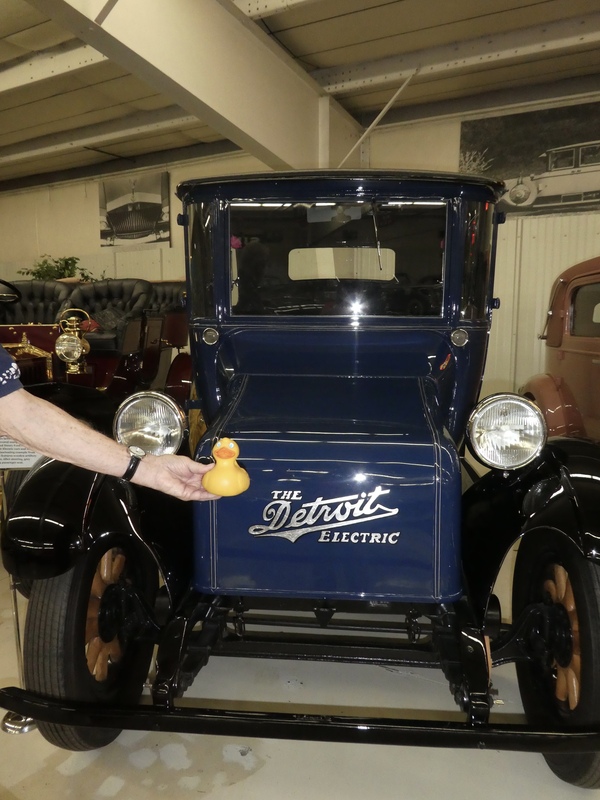 Mr. Cussler collects and restores classic cars. 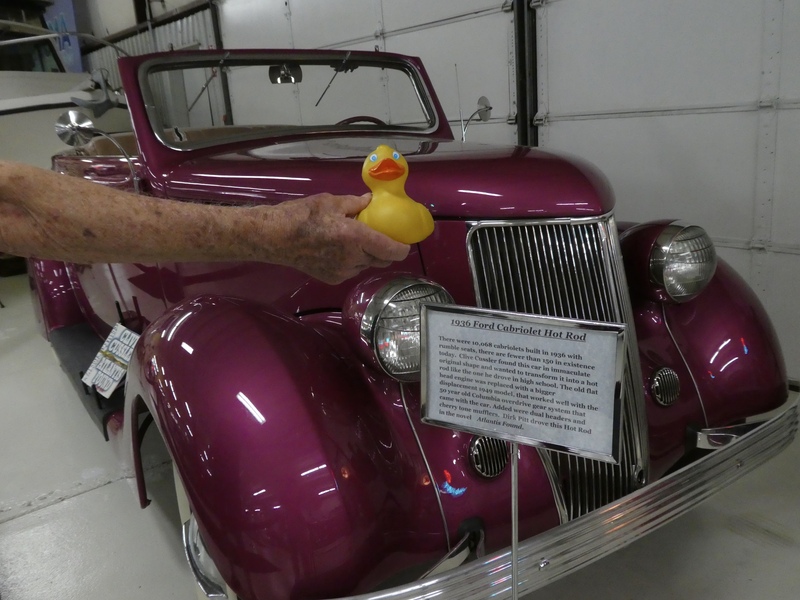 At any time, 60-70 of his cars are on display in his museum, near Denver. Mom and a friend recently accompanied me to the museum. I really liked the first car we saw as we entered. This 1956 Continental is gorgeous, and huge. 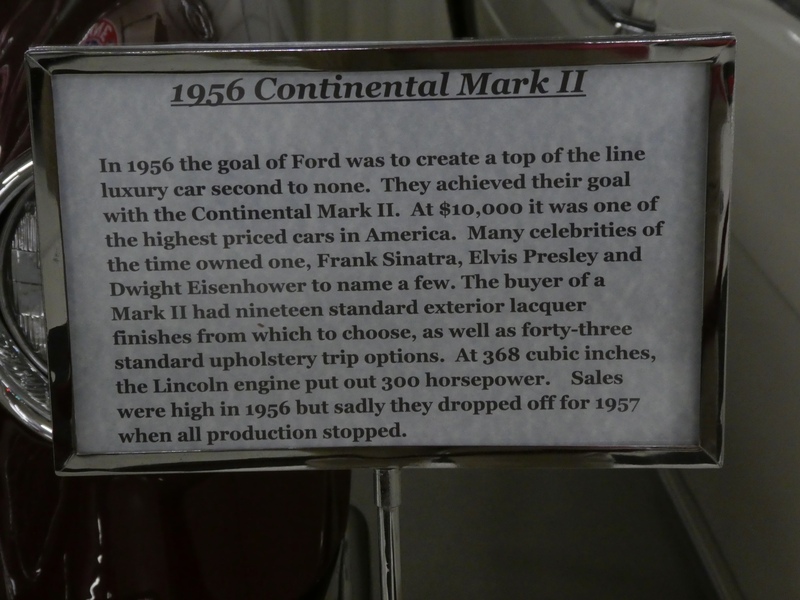 Each automobile has a sign to explain the history of the car. I decided to just show you the sign rather than paraphrase the information. Look at this bright pink car. This is a 1936 Ford Cabriole Hot Rod. 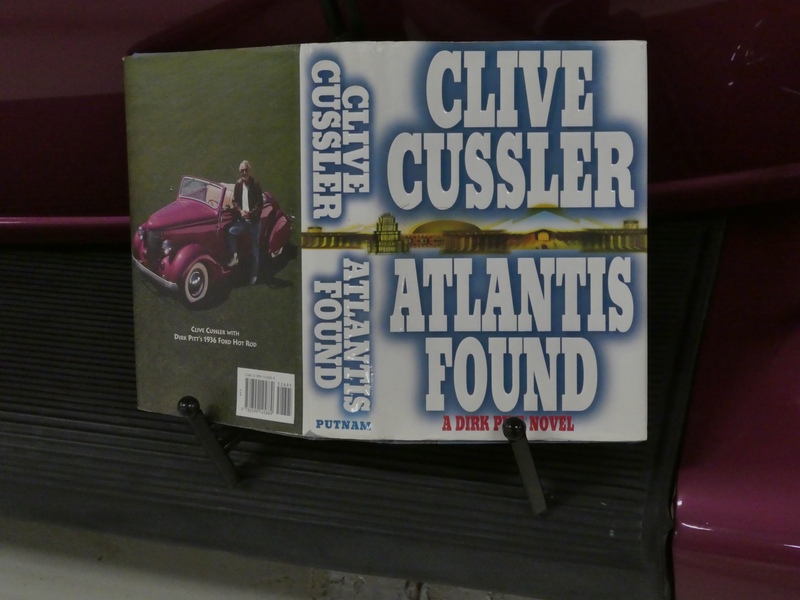 Mr. Cussler often has a character in his book, Dirk Pitt, drive a car like he owns. This Cabriole was featured in Atlantis Found. 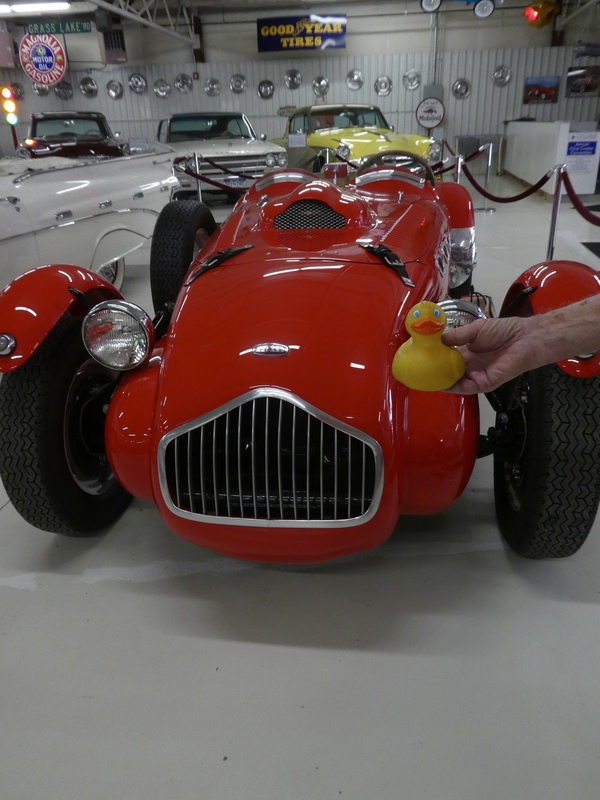 And this bright red 1953 Allard J2X. 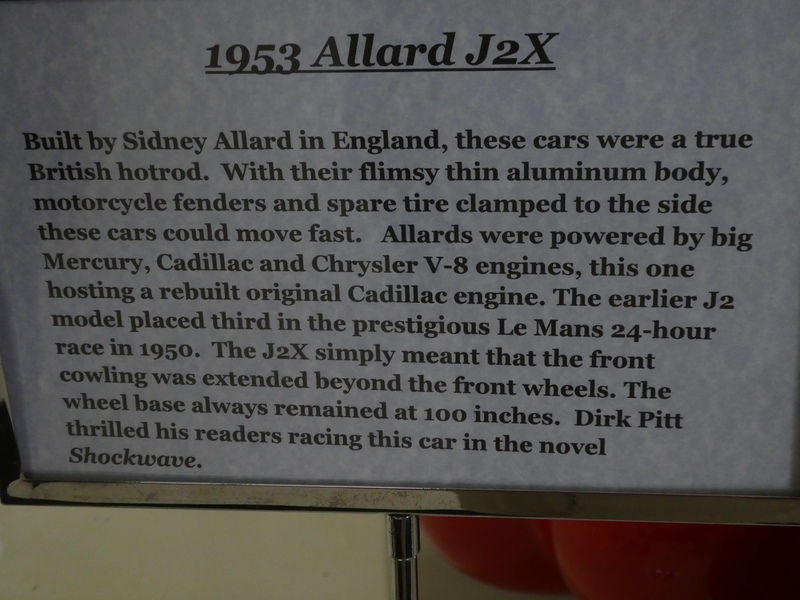 The 1953 Allard J2X was featured in his book, Shock Wave. 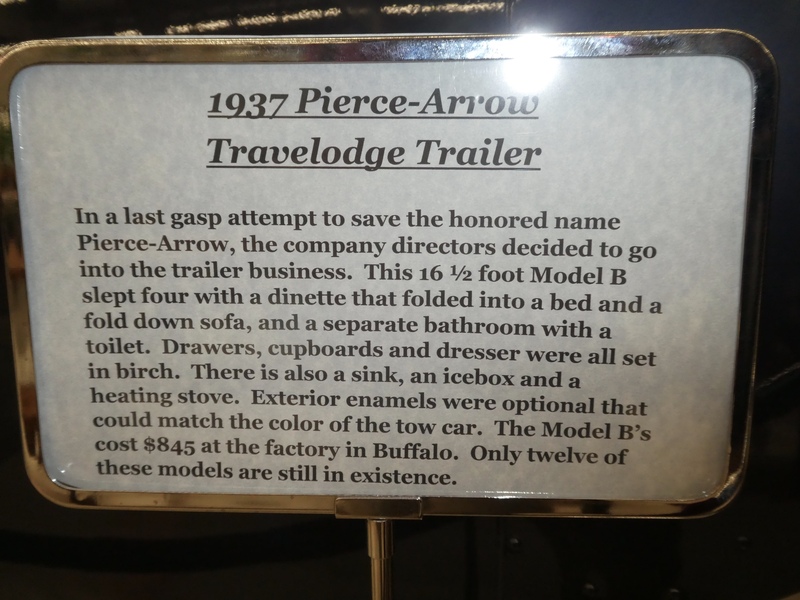 This Pierce Arrow was a surprise. 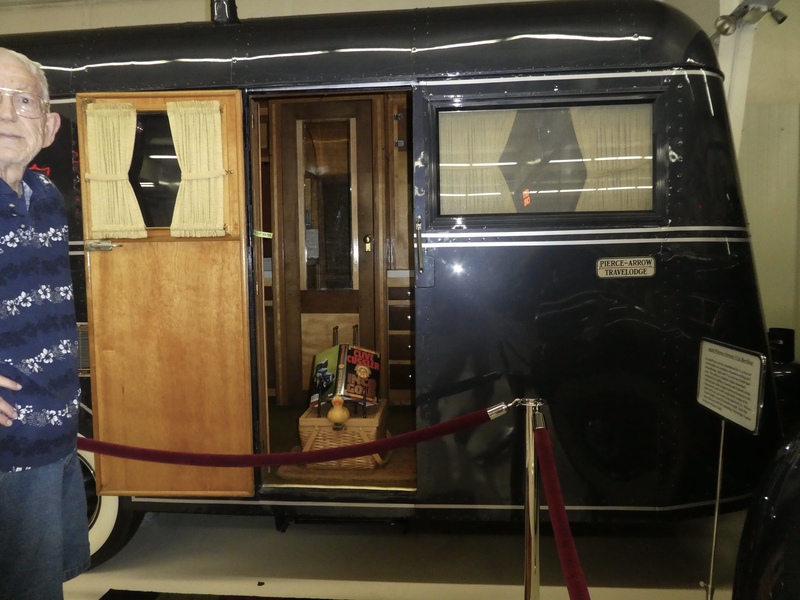 This is a 1937 Pierce Arrow Travelodge Trailer. And we thought motor homes were relatively new. This orange car caught my attention. 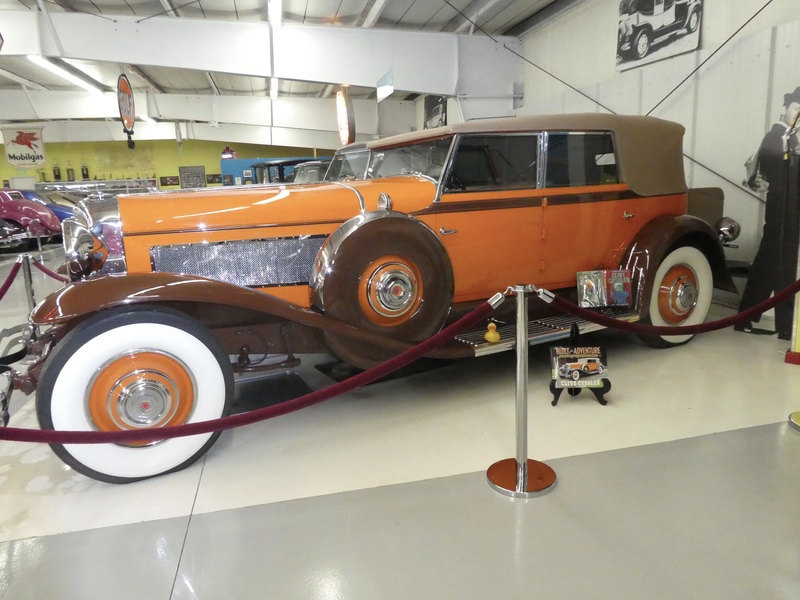 This 1929 Duesenberg Model J-140 was featured in his book, Flood Tide. In the 1970s Mattel Toy Company patterned one of its famous “Hot Wheels” on this model. What is this? 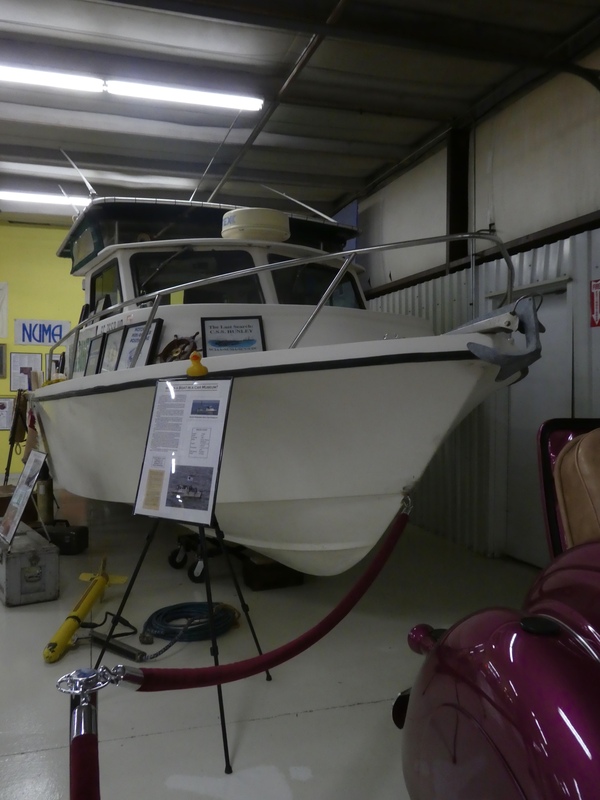 A boat in a car museum? Of course. 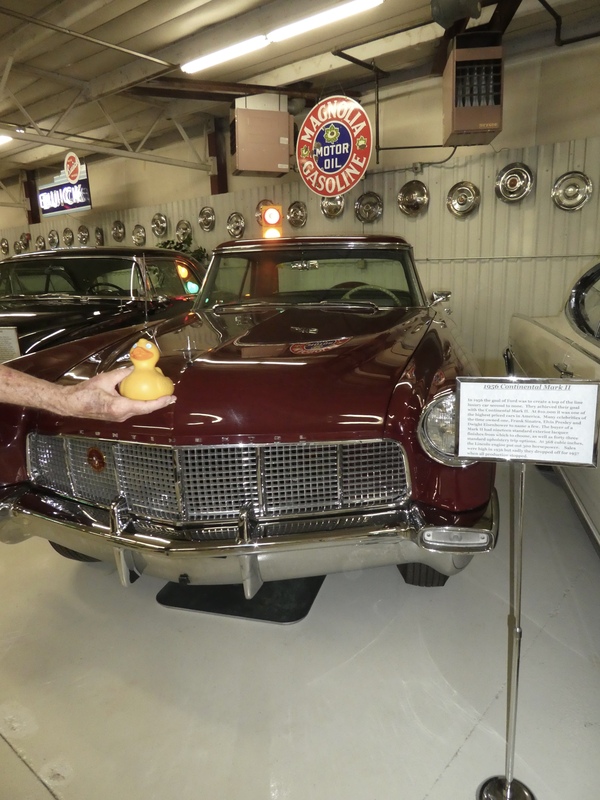 Clive Cussler has interests beyond writing and cars. He loves to locate shipwrecks. With this boat he helped find the H.I. Hunley, a Confederate submarine, the first submarine to ever sink a ship. This happened during the United States Civil War in 1864. 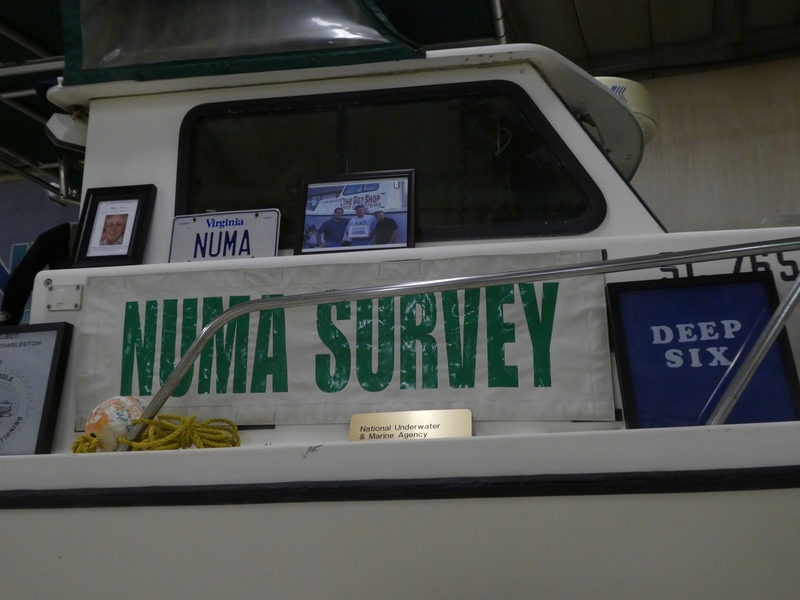 NUMA Survey is one of his boats. You have noticed the popularity of the new electric cars. But, maybe not really so new. 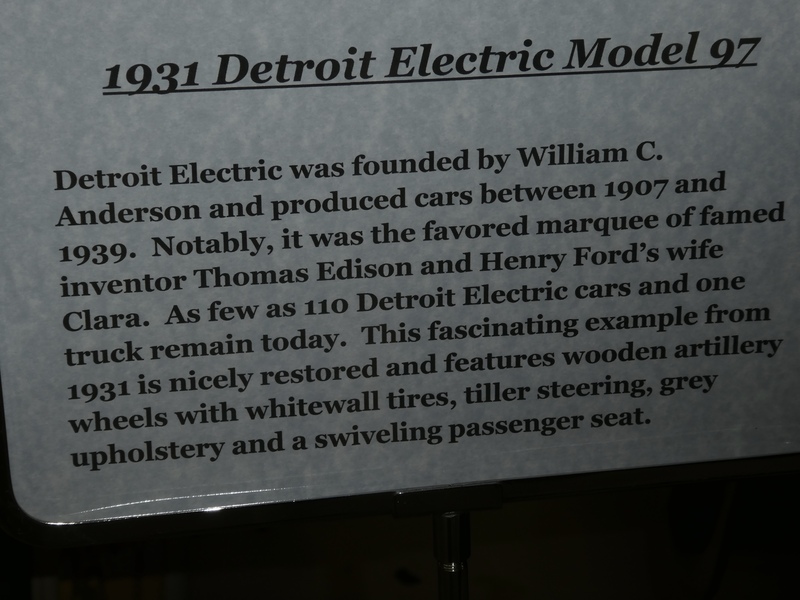 Here is a 1931 Detroit Electric Model 97. Yes, really. 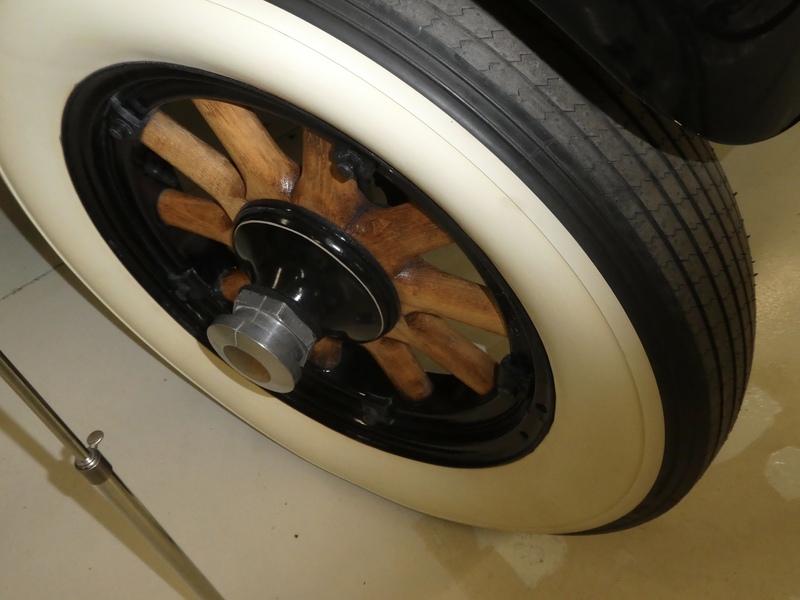 Here is a photo of the wooden wheel on this 1931 Detroit Electric Model 97. When you are near Denver, you really would enjoy this museum. However, it is only opened in the summer. 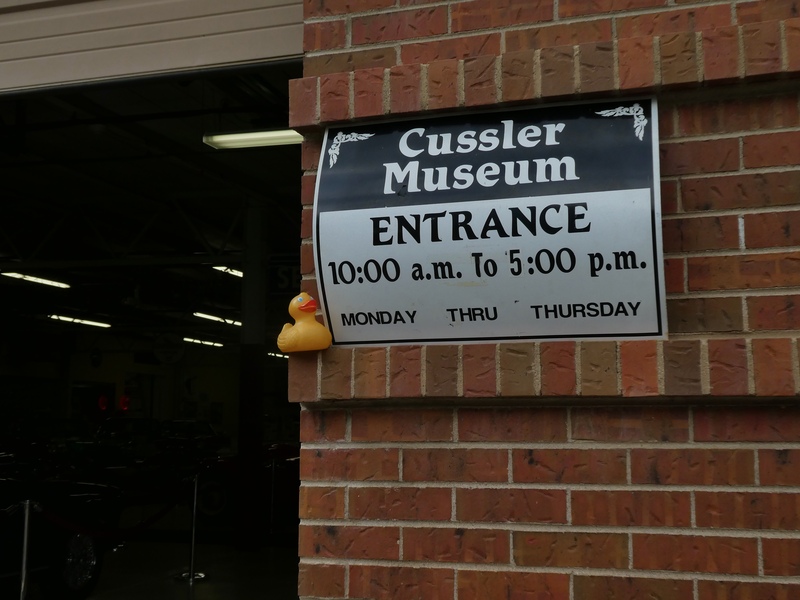 Check http://www.CusslerMuseum.com for more information. There is a motorcycle in here. And so many more cars. And they are not only clean and shiney, there is not a flake of dust near these cars. We hope you visit soon. 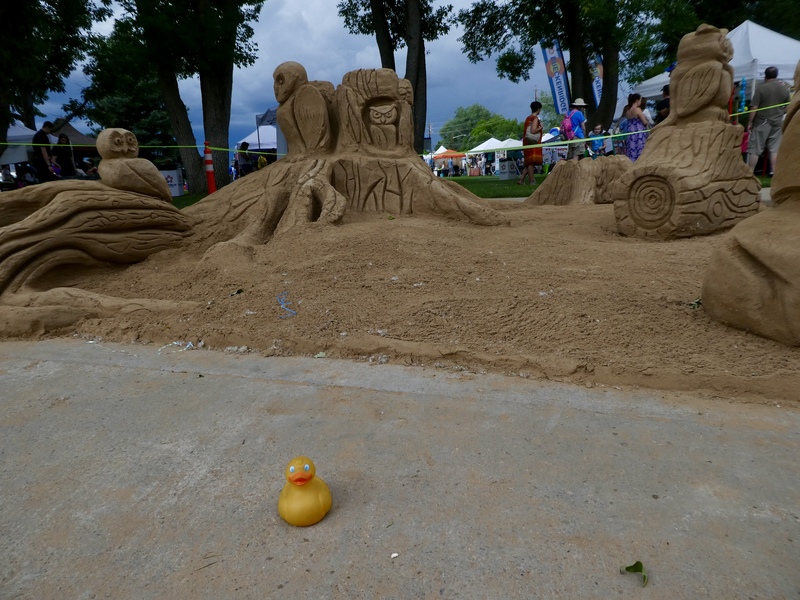 Last Sunday I, Zeb the Duck, took mom to a festival, Sand in the City. We went to Arvada, a suburb of Denver. 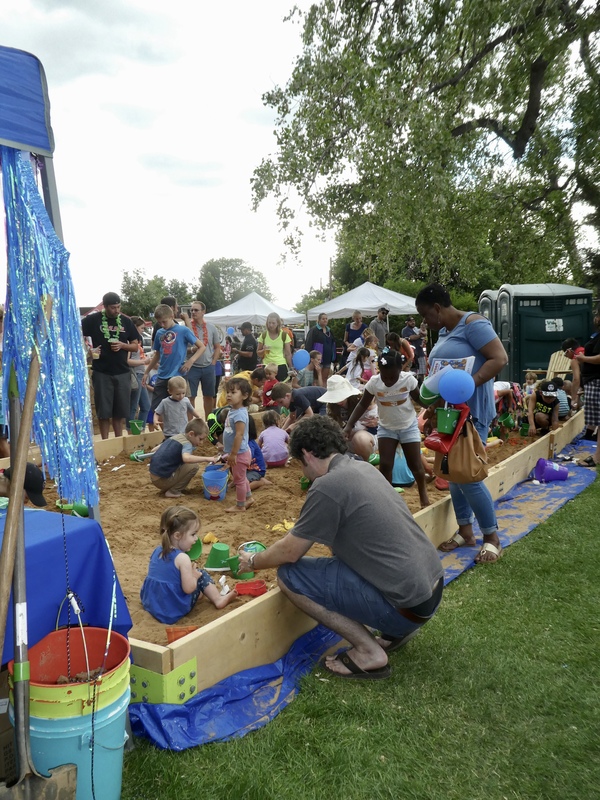 No oceans nearby, but sand was brought in and there was a beach party atmosphere. 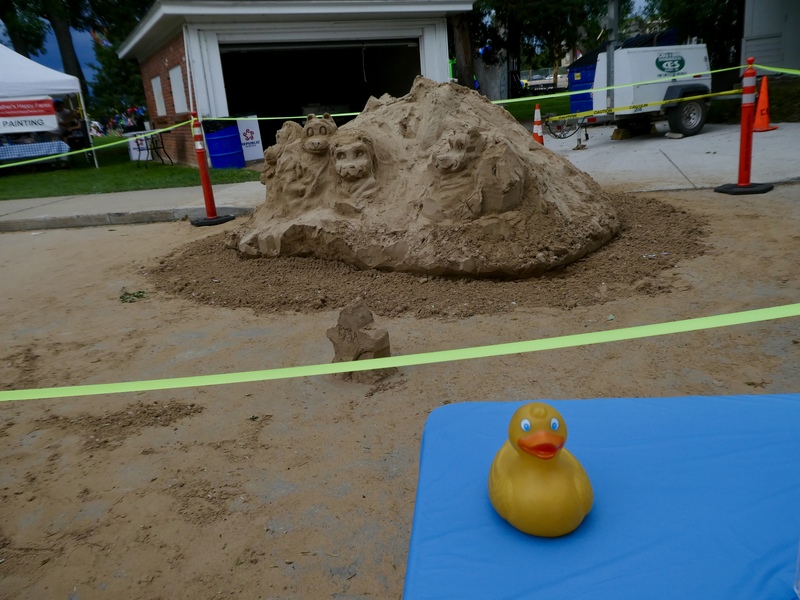 As we entered, this was our first sand sculpture. About emotions. 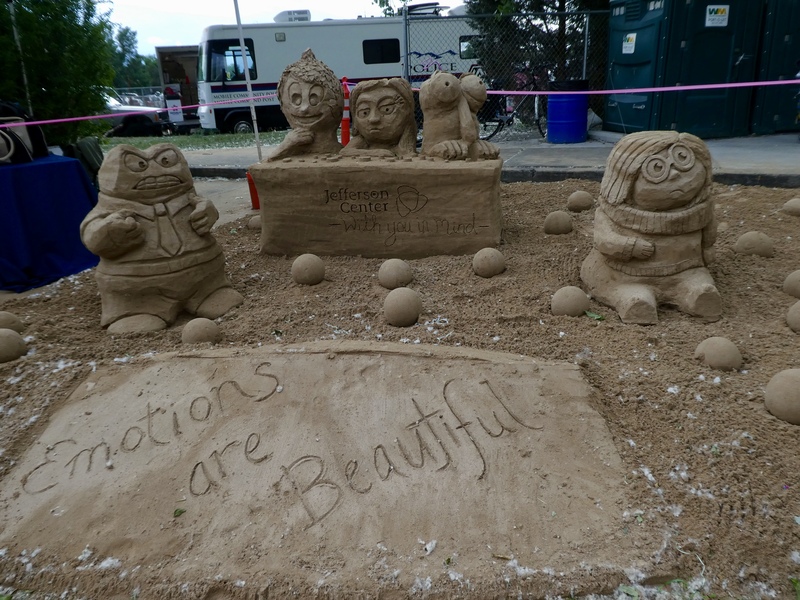 There were many sand sculptures. 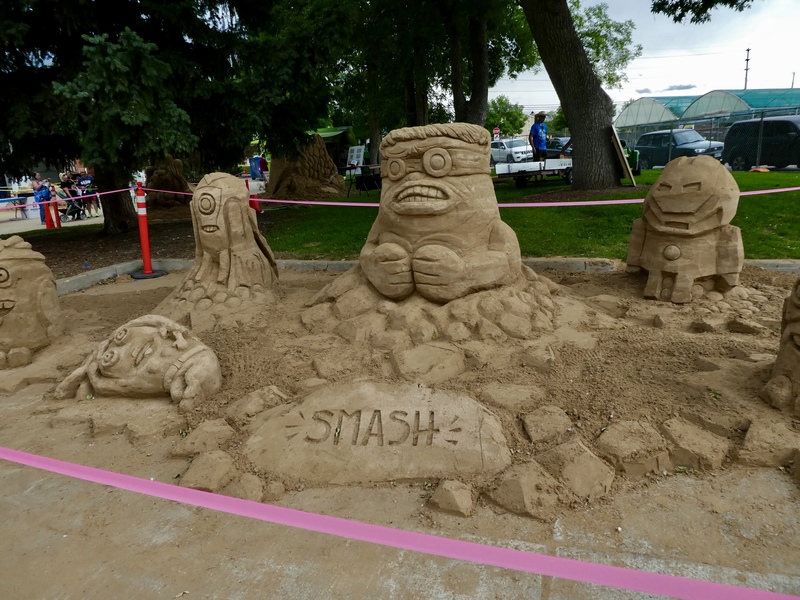 This one says Smash. As you can guess, there were many human children. When children are around, they often want to pick me up and take me home. That is why mom doesn’t put me down and I am not in all the photos. Look at this sculpture. Sponsored by a local hospital, they have one of my giant relatives here. We went to the back and I am in the picture with one of my favorite relatives. I’m by a famous relative. And an ambulance? And an ambulance? Hope we don’t need one today. 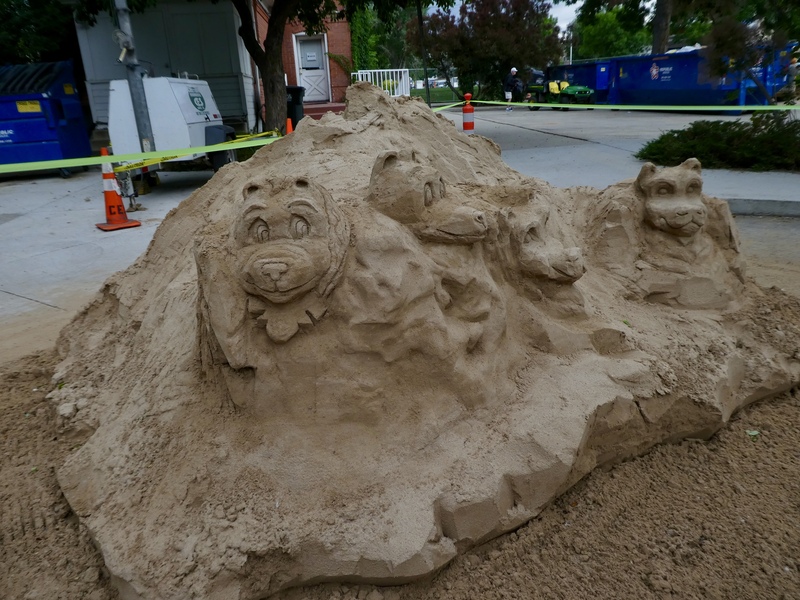 This sculpture won first place. 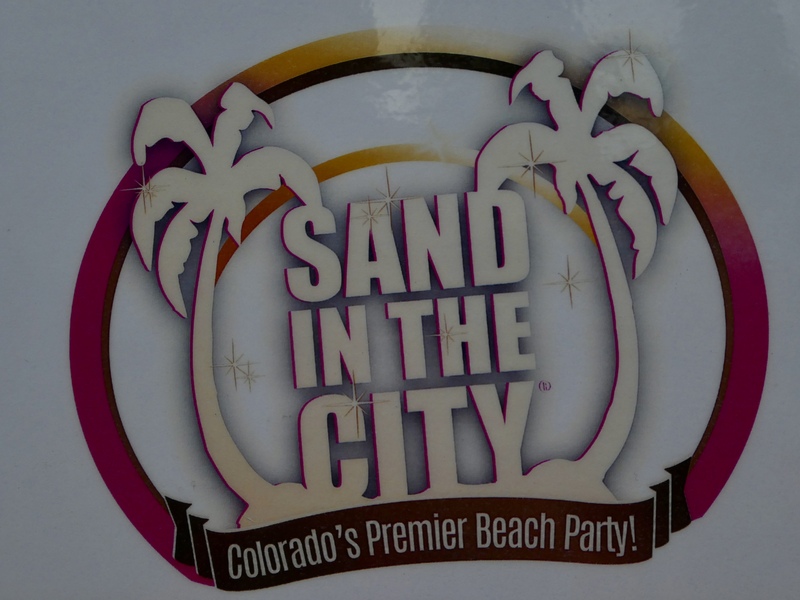 It is sponsored by Red Rocks Community College. We just liked this one. No reason, we like it. The Boy Scouts made this sculpture. We like the Boy Scouts. Nice details guys. 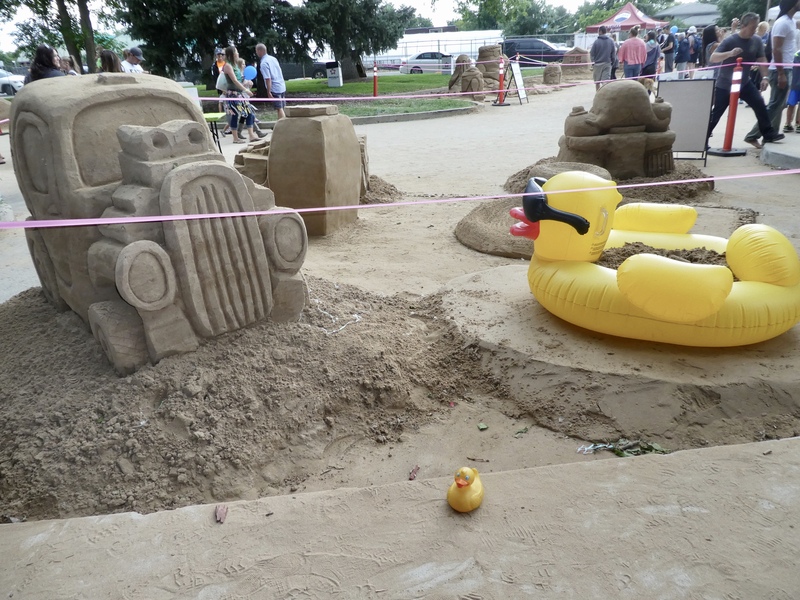 With all the sand, we found the area for small humans to play in the sand. Looks like fun. And this looks fun also. Hula hoops and balls. Too bad I, Zeb the Duck, am not human. There were many other activities for children. The large balls they get inside and try to walk. Also face painting. Lots of vendors selling great stuff. And the food. 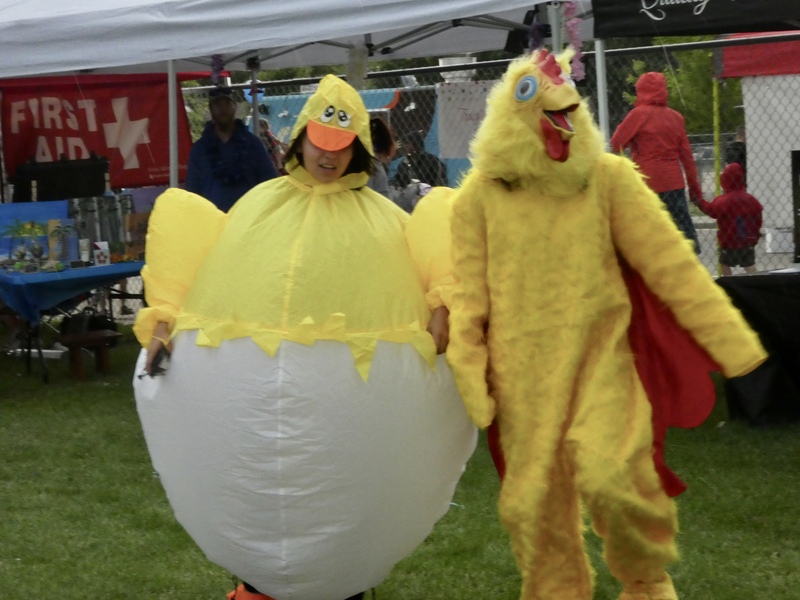 These are our two favorite festival food booths. 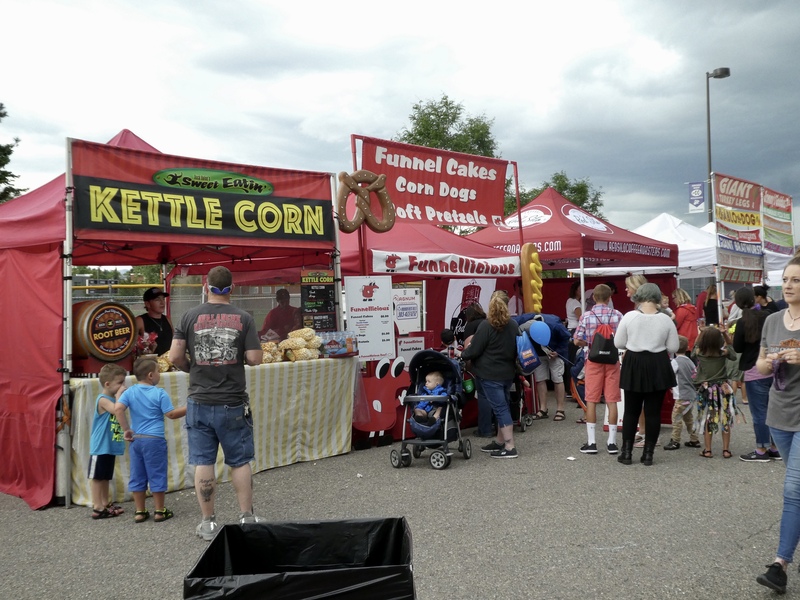 We love Kettle Corn and Funnel Cakes are irresistible. Some great costumes. Aren’t they cute? The entertainment stage always seemed to have musicians. And dancers. 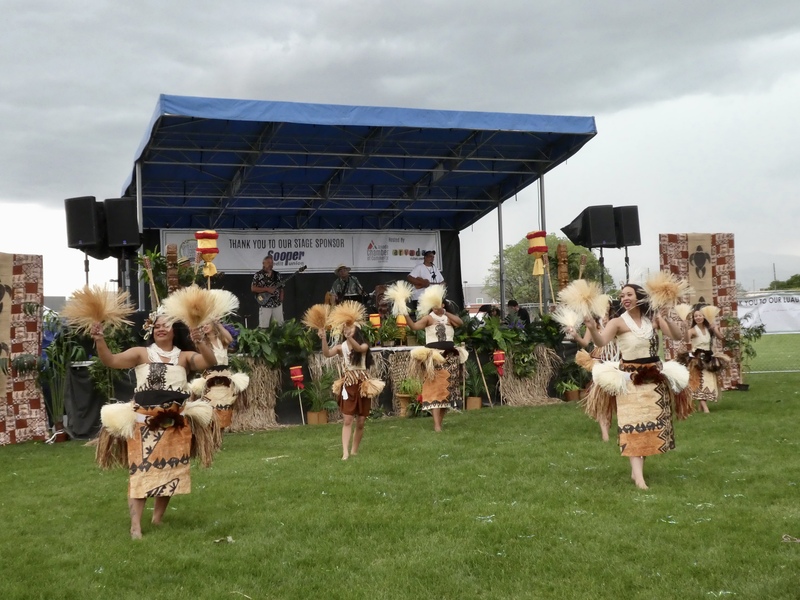 Our beach party featured Pacific Island dances from Hawaii, Samoa, Tahiti and others. Dark storm clouds were coming over our Rocky Mountains. 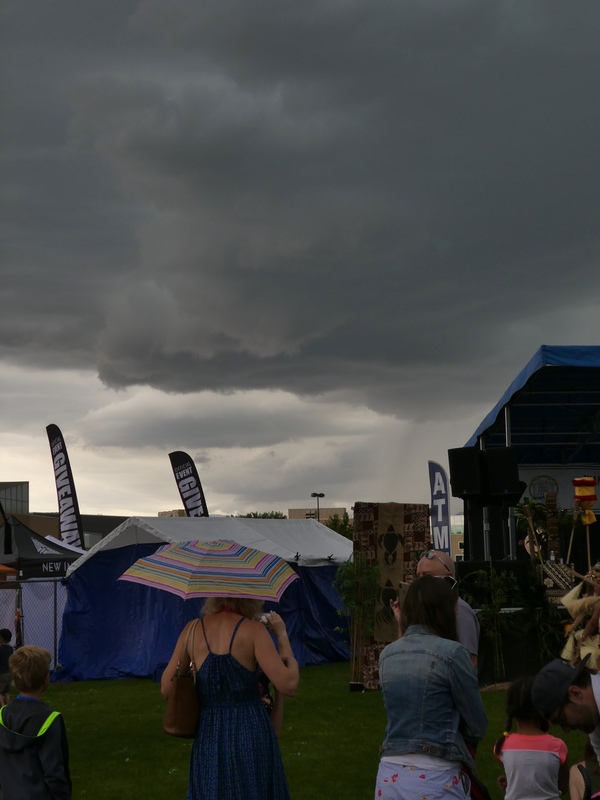 Dark clouds. Time to leave? We decided it might be time to leave. Not raining yet, but we walked to our car and within 3 minutes in was raining hard. 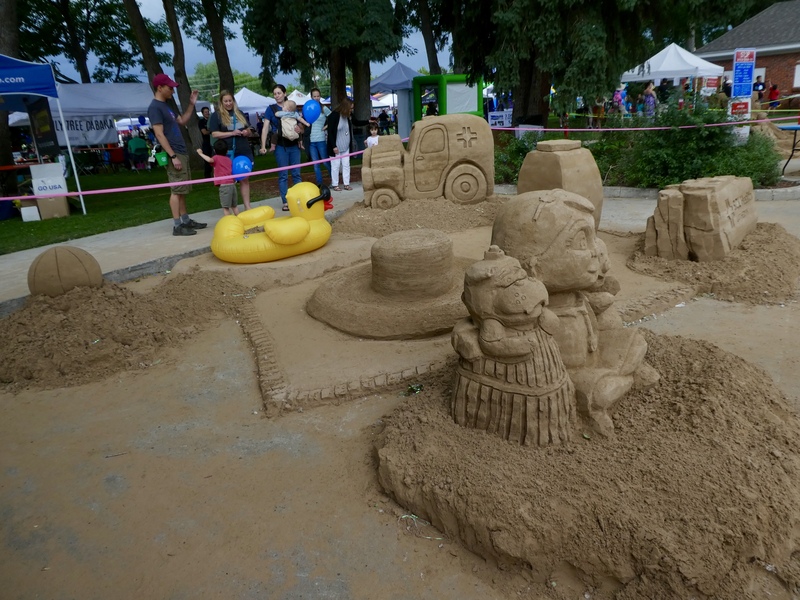 We don’t know if the sand sculptures were covered or if they were damaged. 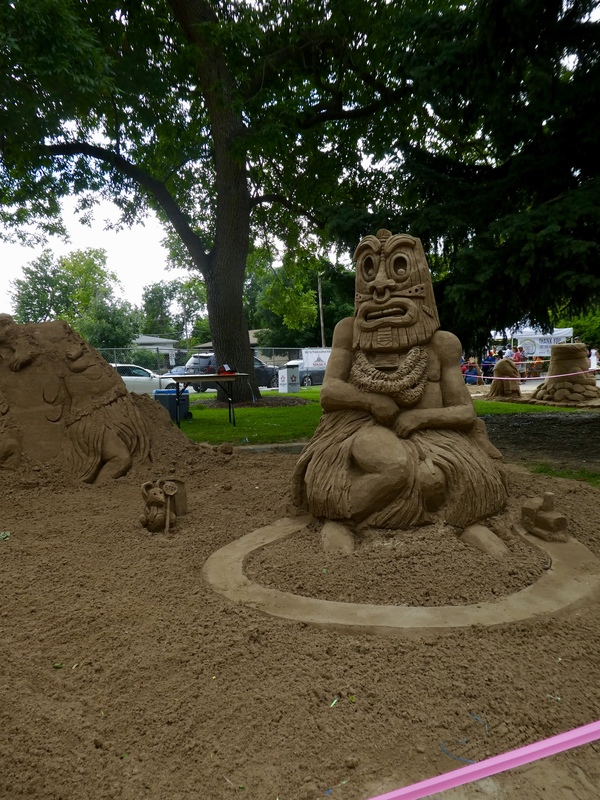 The festival had a few more hours before scheduled closing, but we think the sculptures were damaged. A few hours later, the rain stopped, the sun was shining and our bright blue Colorado sky was clear. We hope you are enjoying festivals this summer. They are fun. Ready to go to our first Alpaca Show. We are in Denver at the National Western Complex. 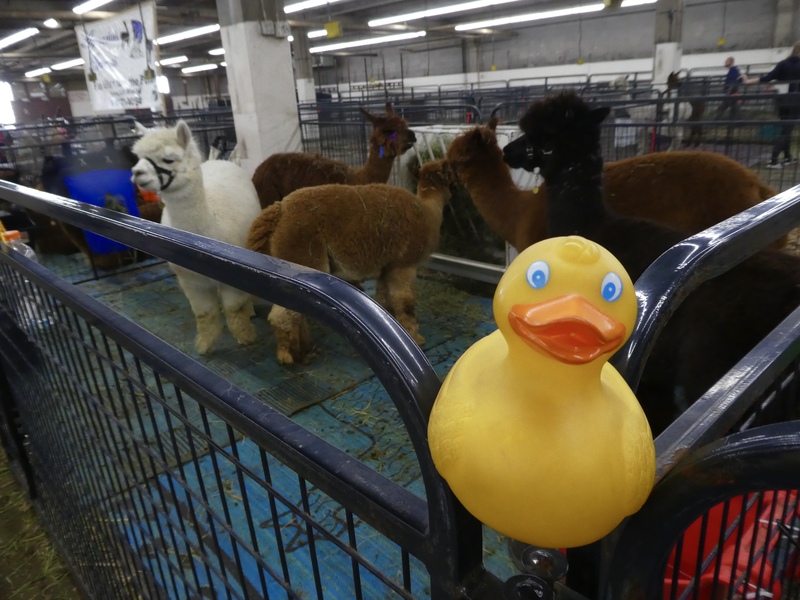 This is where Denver hosts the National Western Stock Show and Rodeo. 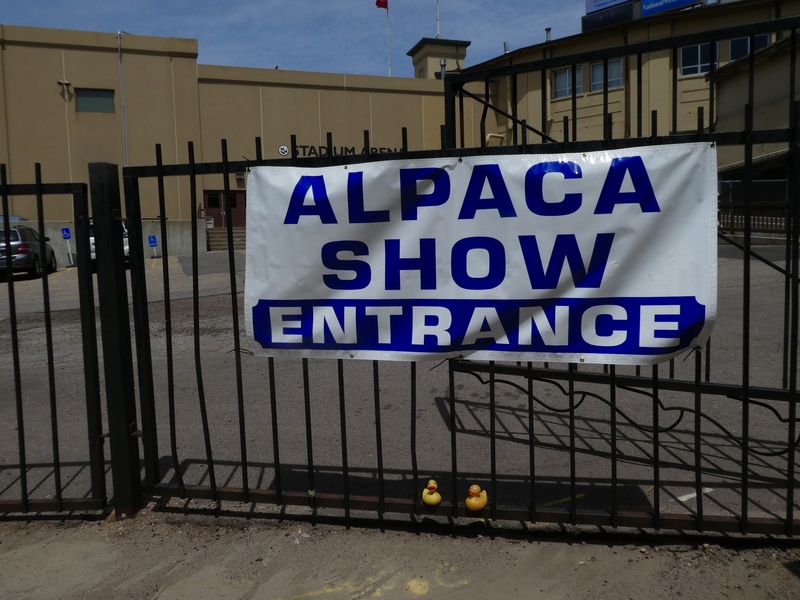 Let’s see some alpacas. 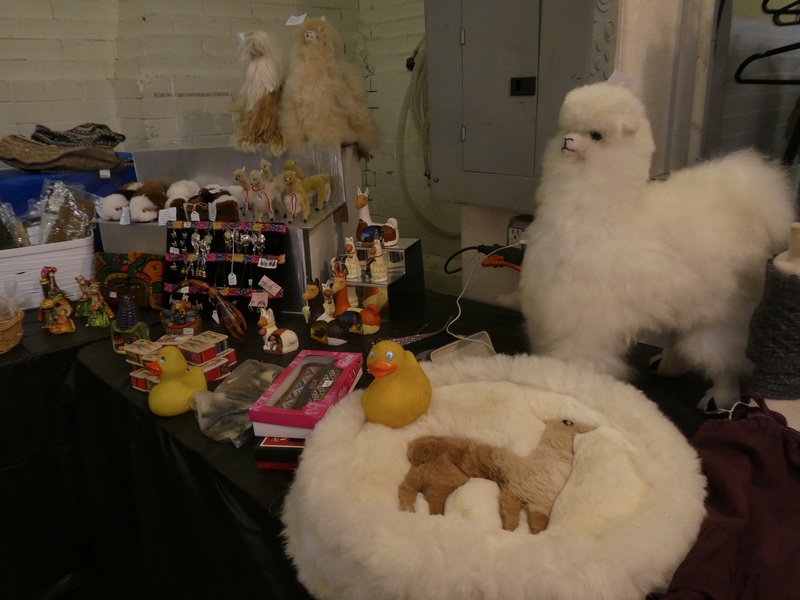 There are lots of alpaca at this show. These alpaca are watching us. Some judging already took place here. 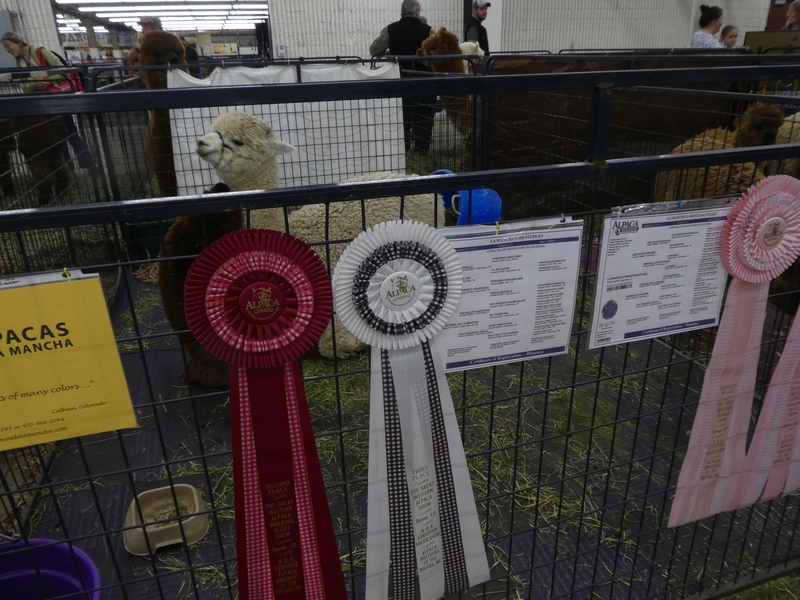 This white alpaca has ribbons. 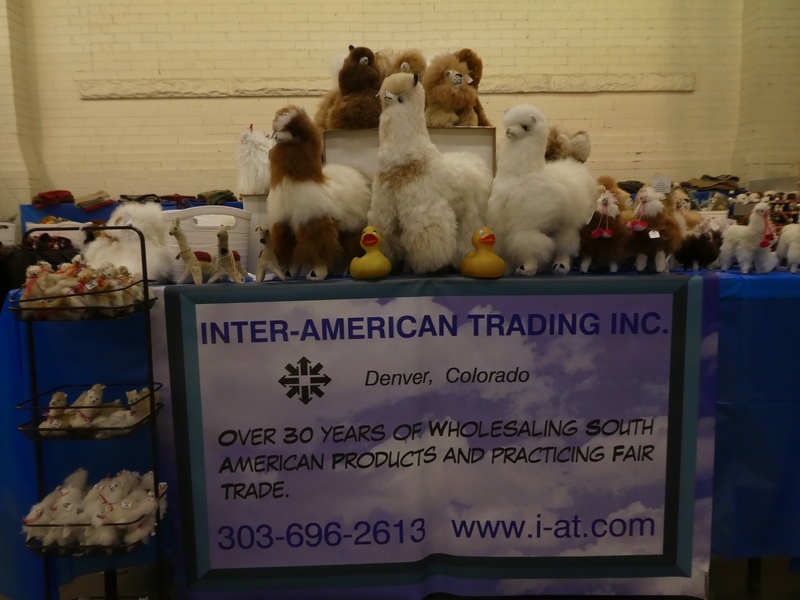 Alpaca is from Alpacas de la Mancha in Calhan, Colorado. The brown ones are good. We love these guys. 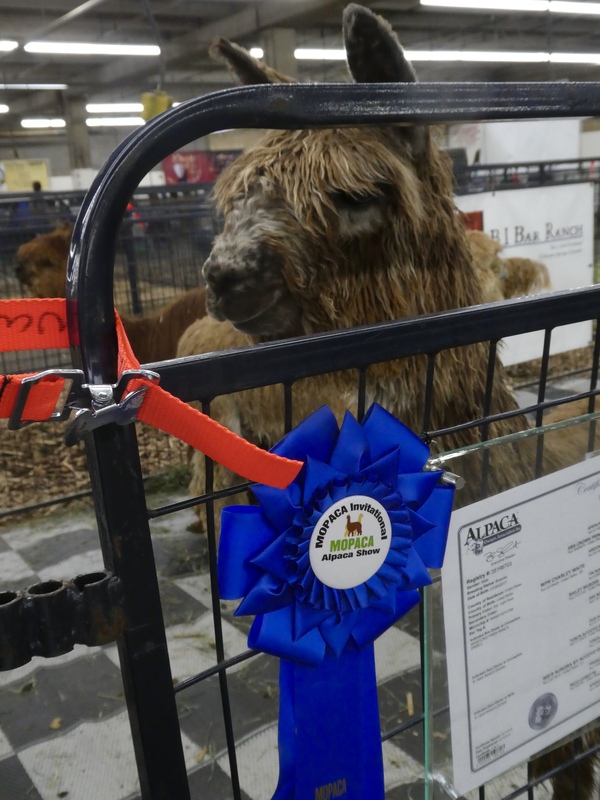 Here is a blue ribbon winner. Our new friend. 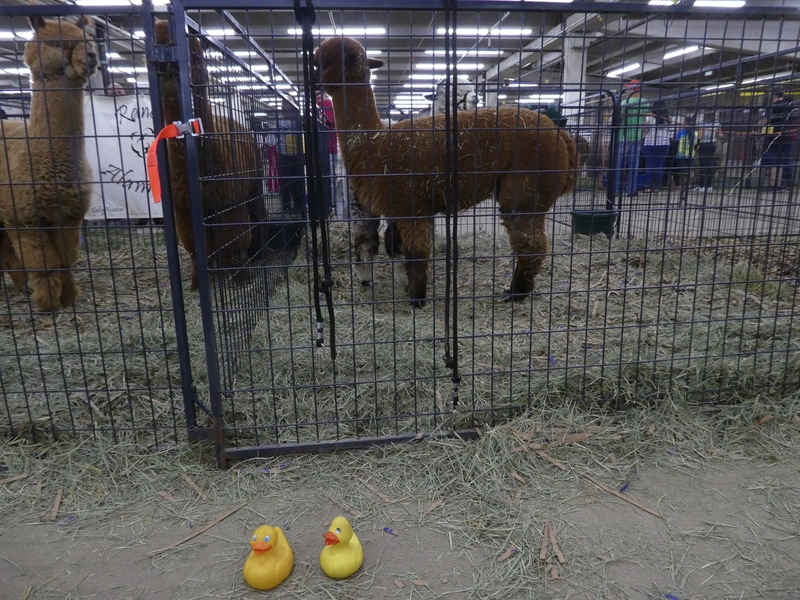 In the next area we found these smaller alpaca. They have recently been sheared. The alpaca wool is really soft. 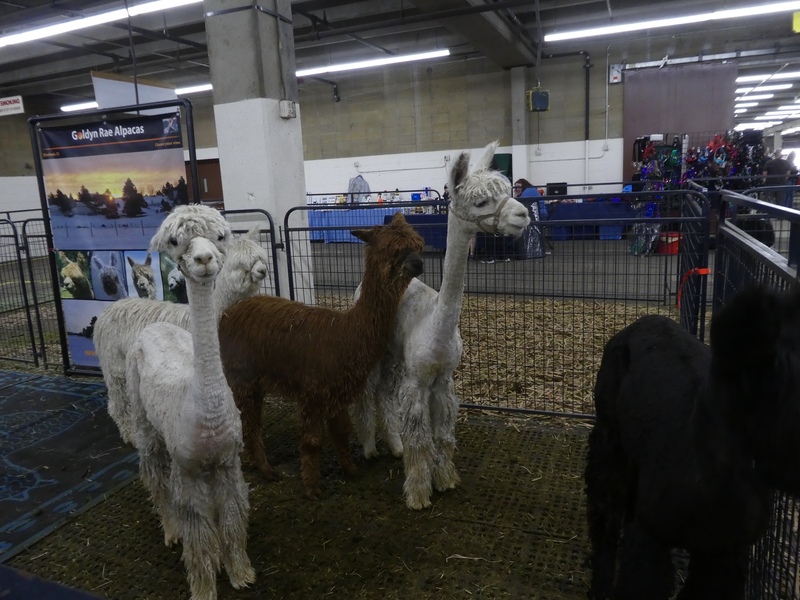 The necks look really long without the extra wool. 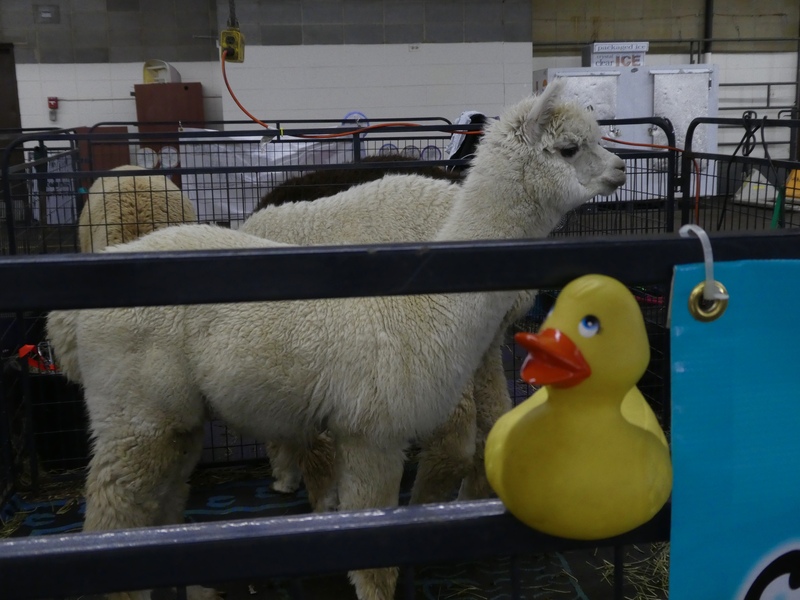 Eider Duck likes this white alpaca. And he likes Eider. 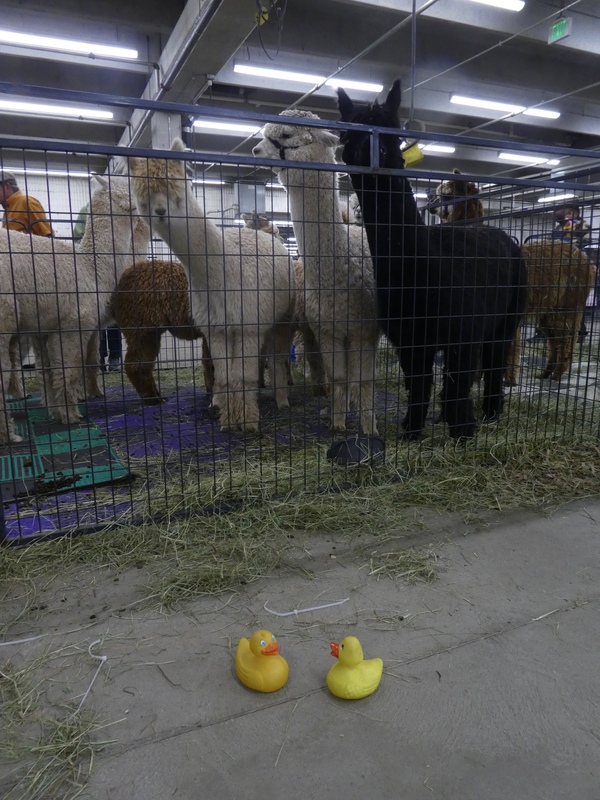 Zeb likes these alpacas with lots of wool still on them. But we really like all of them. One more alpaca photo. This one likes us. Like many a band prevents any nipping. 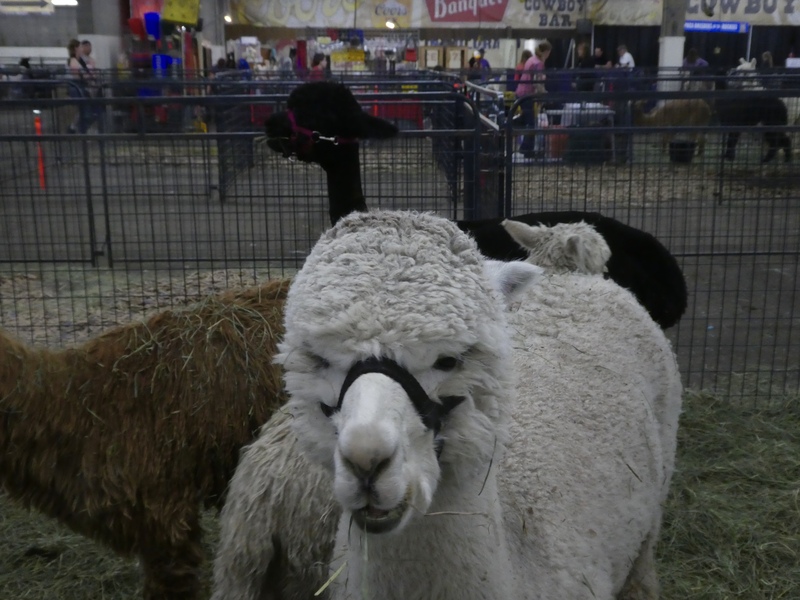 This white one, like many alpaca here at the show, has the harness or bands around the mouth. No nipping here. 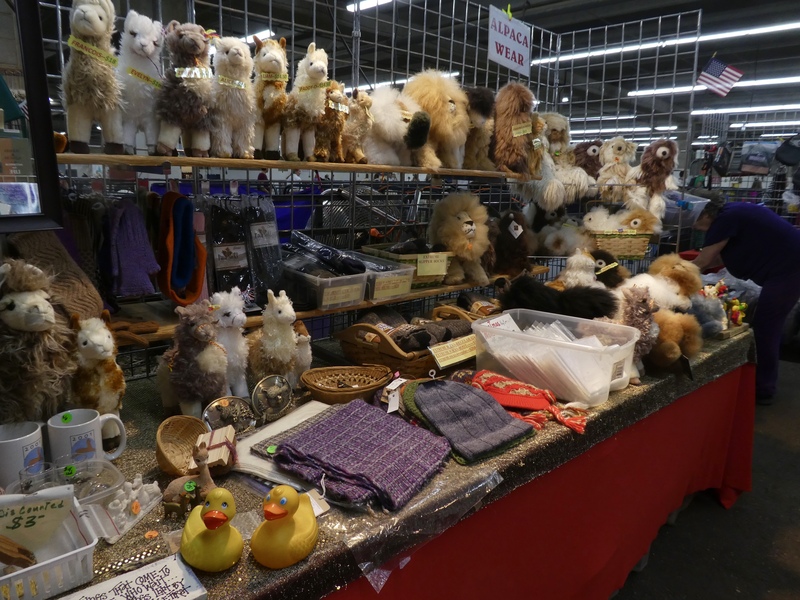 So many items are made from alpaca wool. We will show you several booths with items for sale. Even holiday sets. Great choices. 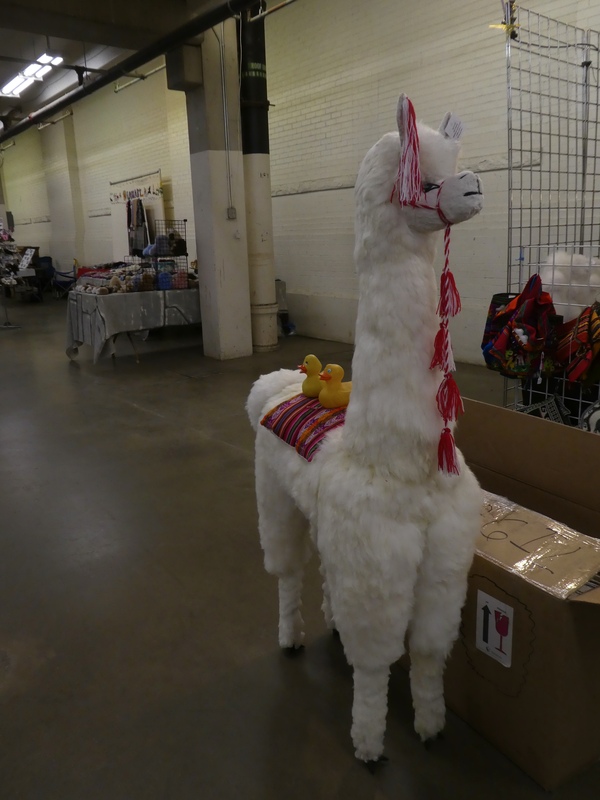 Alright, we can sit on this alpaca. No worries about nipping or biting. And more items for sale. 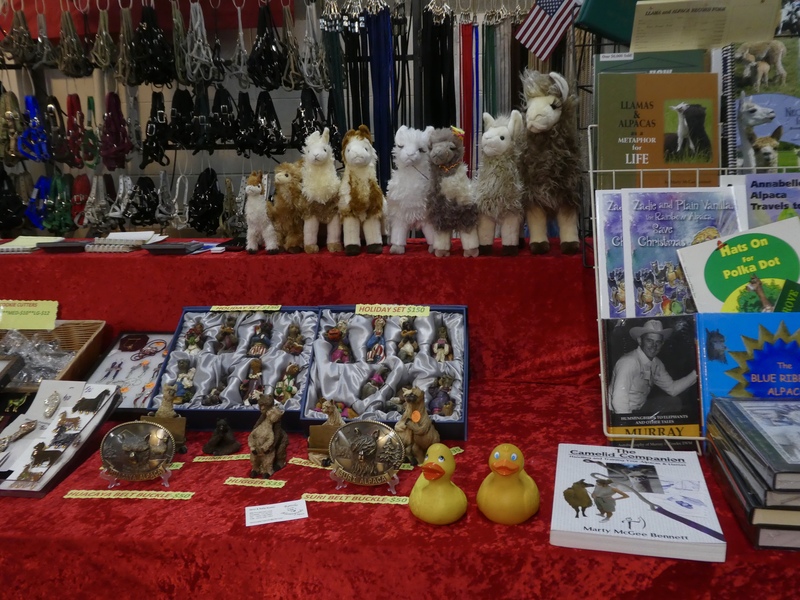 The vendors were all very nice and have so many things to sell and show us. Last photo. Here we are with a live alpaca. The owners of the alpaca are holding us and we love these animals. 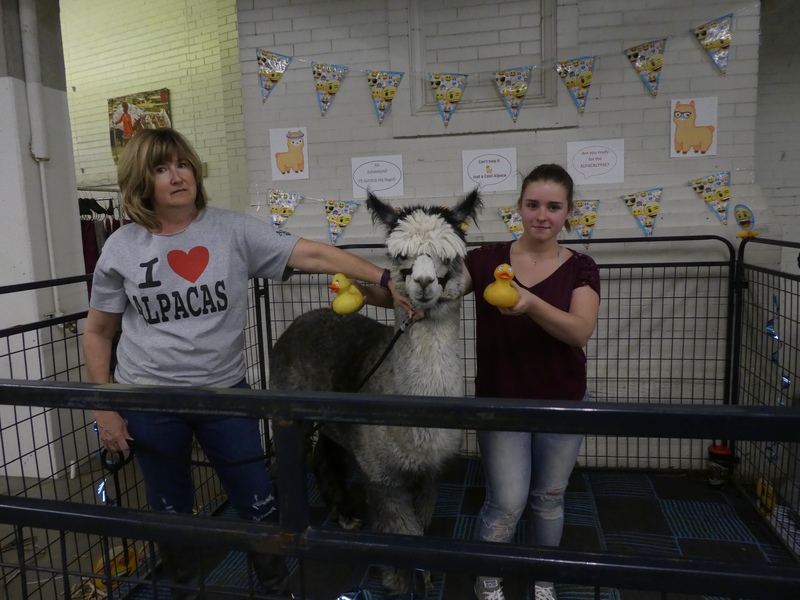 We hope you visit alpacas soon. They were really nice to us. We were surprised to see so much open land between cities. Our tour covered the Golden Triangle. The three cities were Delhi, Agra and Jaipur. These cities are all within an easy day drive. 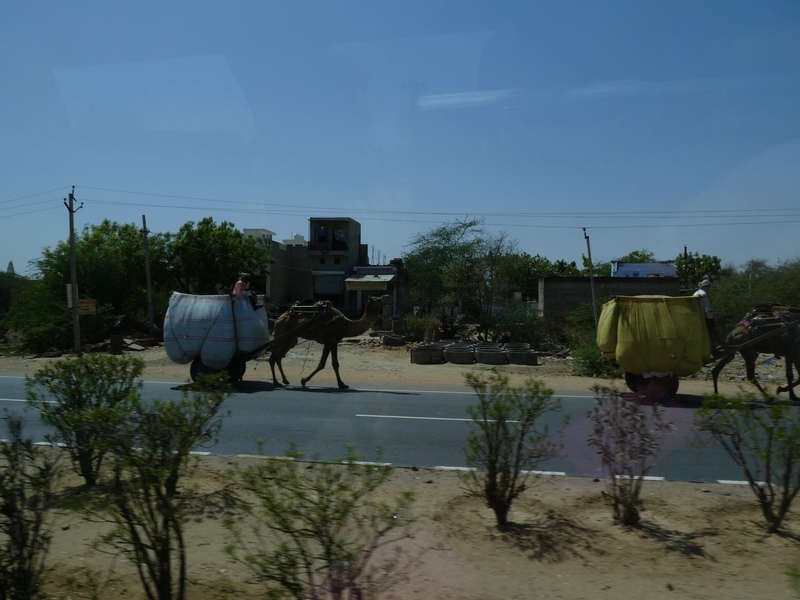 Traveling by bus, we were able to see more of India. The farm land was a pleasant surprise. This man is working in his field. Something is happening. We are pulling off the road. Our bus is broken. Our driver and assistant tried to repair the bus, but a new one is coming for us. We get off the bus, stand outside enjoying the breeze and look around. 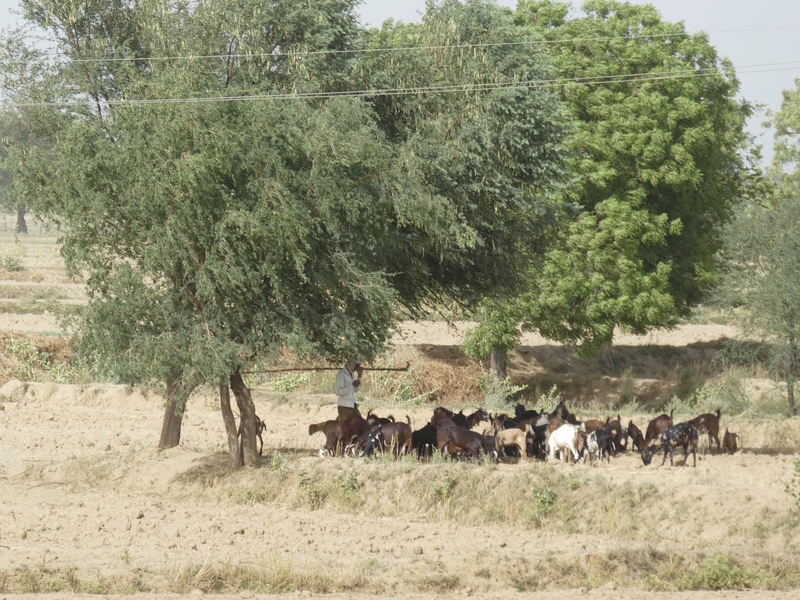 A man is herding these goats. We like the shape of this hut. Another day we stopped for lunch. Mom wanted a picture of the elephant statue. She really liked it. Then she decided to get a photo of us with the elephant statue in the background. This friendly gentleman offered to pose with us. Isn’t that great? We loved it! Camel carts. These are working camel carts. We do not know what they are carrying, but it looks interesting. 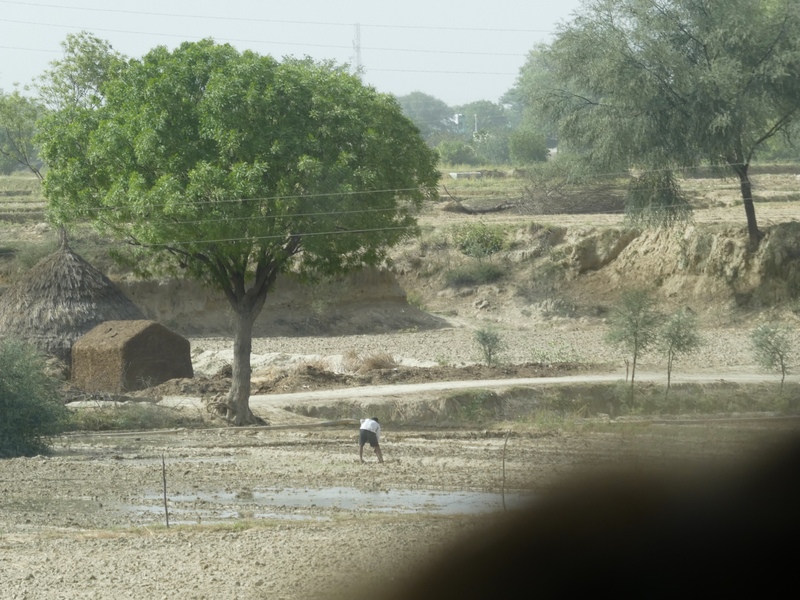 On our way back to Delhi, we noticed something along the road. 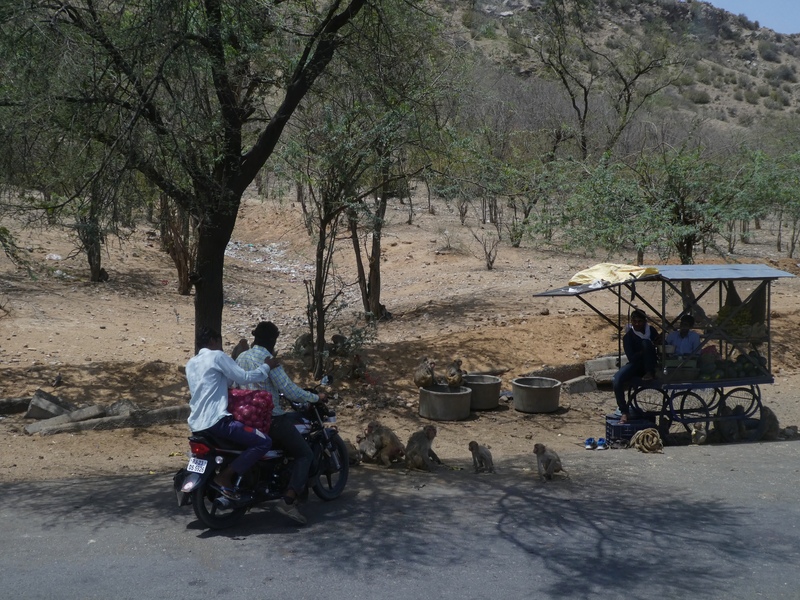 The motorcycle stopped by the fruit stand, but there are monkeys here. Jesse, our guide, gets off the bus, purchases watermelon, cuts it up and feeds the monkeys and cow. 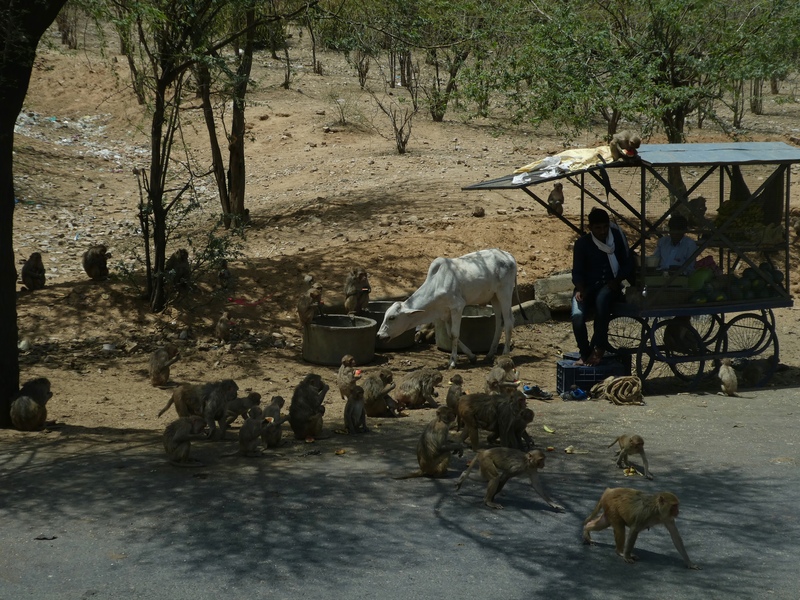 There are monkeys coming from everywhere. We tourists, humans and ducks, are enthralled at this scene. Don’t you love it? There is even a monkey on top of the cart. Well, our time in India is ending. We are back in Delhi now. 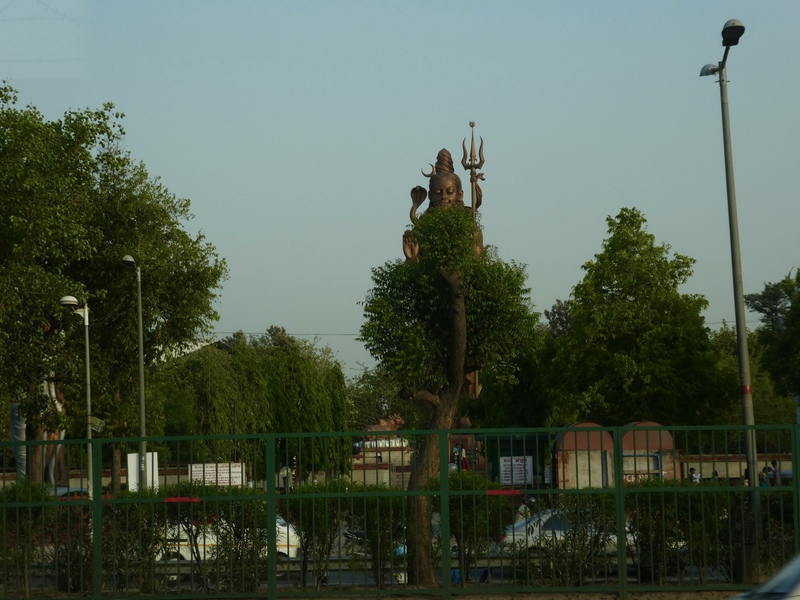 This Hindu statue is partially behind a tree, but it was the only we could get a picture without a vehicle in our way. And yes, there are many vehicles here. This is not a parking lot. 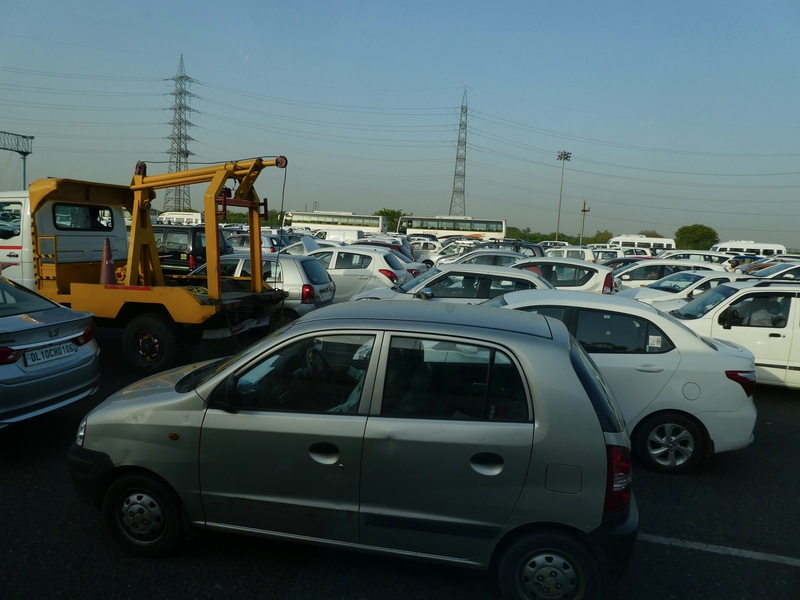 All these cars have drivers and they are in several lines to pay at the toll booth. 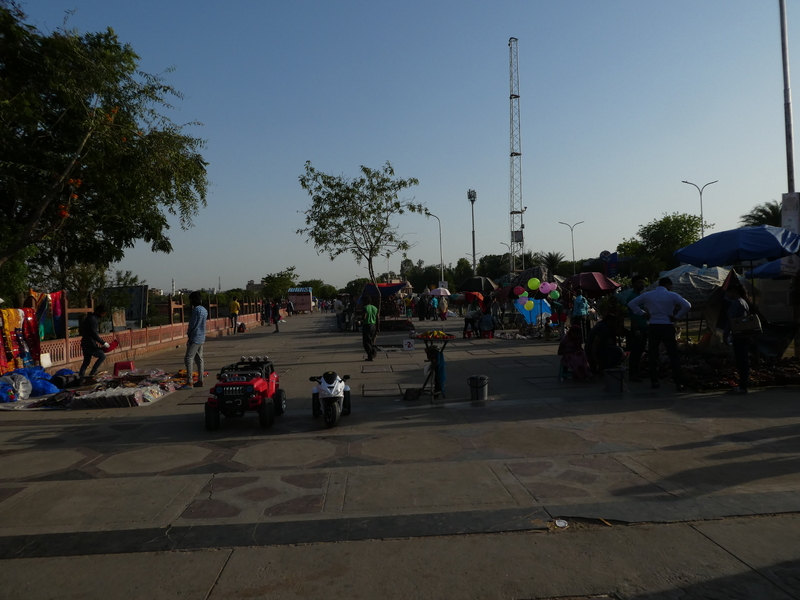 Very few cars in the rural areas, but the cities are really crowded. We came to India with SmarTours travel company. We think they did a very nice tour for us. 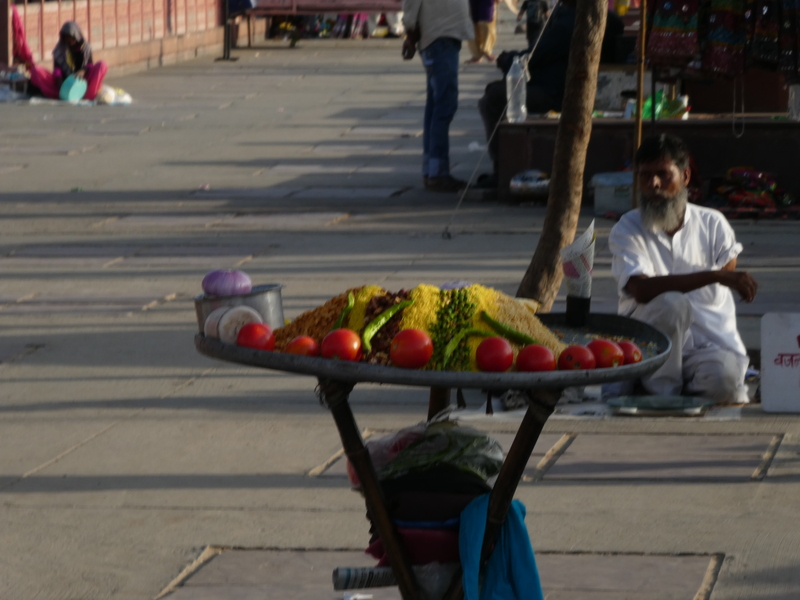 If you are thinking of visiting India, see what is offered at http://www.SmarTours.com Well, this is the end. 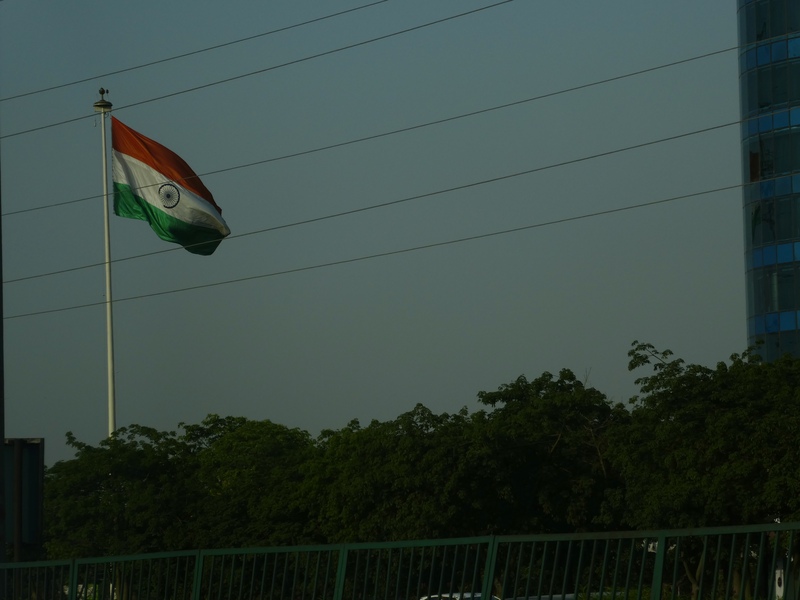 Farewell to India. We had a wonderful time and saw so much. We saw so many things here that we do not have at home in Colorado. Jaipur is the capital of the desert state of Rajasthan. 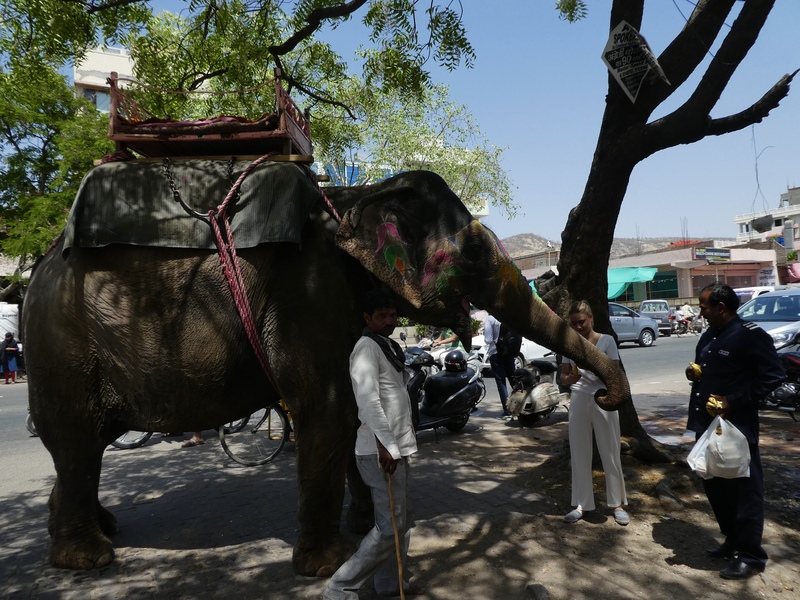 This elephant is waiting for attention from a tourist. This young lady is petting the elephant’s trunk. Later she gave the elephant a snack. And if elephants on the steet wasn’t enough, look at this. 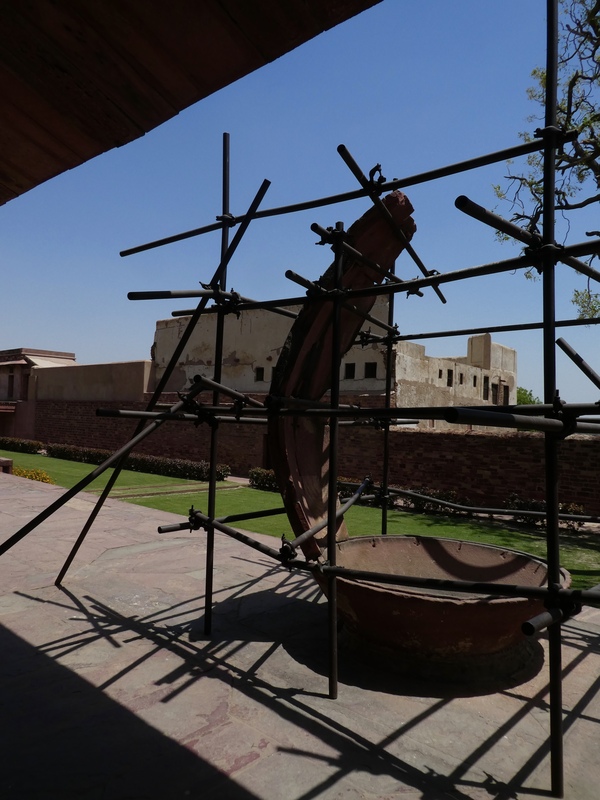 A camel cart. We have seen horse carts, donkey carts, and now a camel cart. 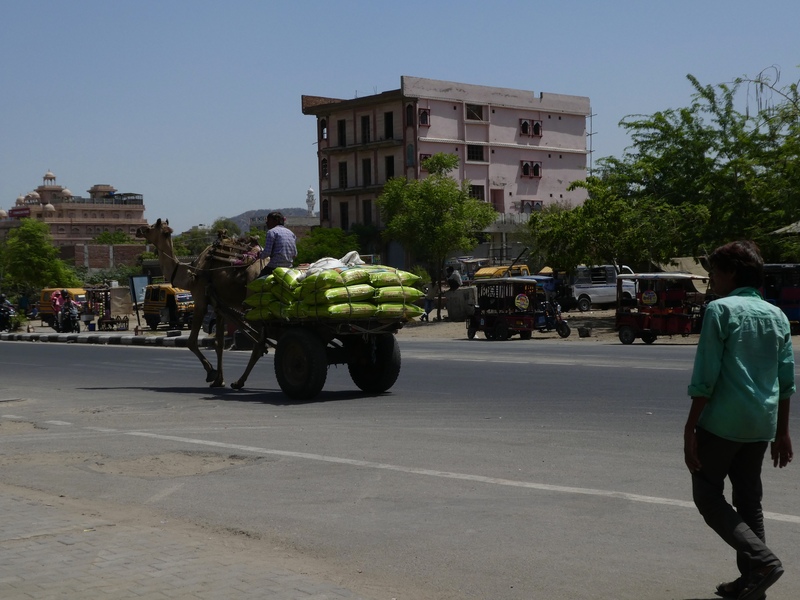 Not even for tourists, but a working camel cart. 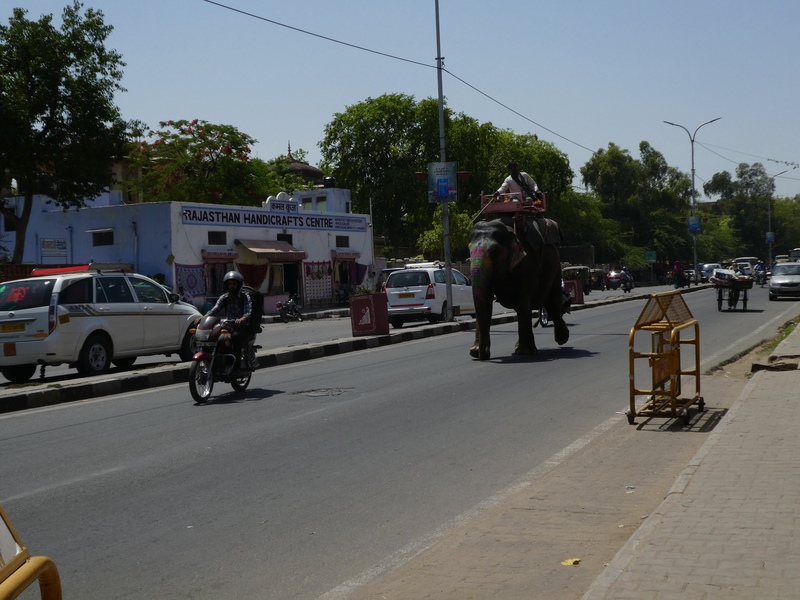 Here, in front of the Rajasthan craft center, you can see many forms of transportation. The man is riding his elephant. A man on a motor bike is driving on the street. Also, a person pushing a cart of merchandise is working toward his destination. And, of course, cars are driving on the street. 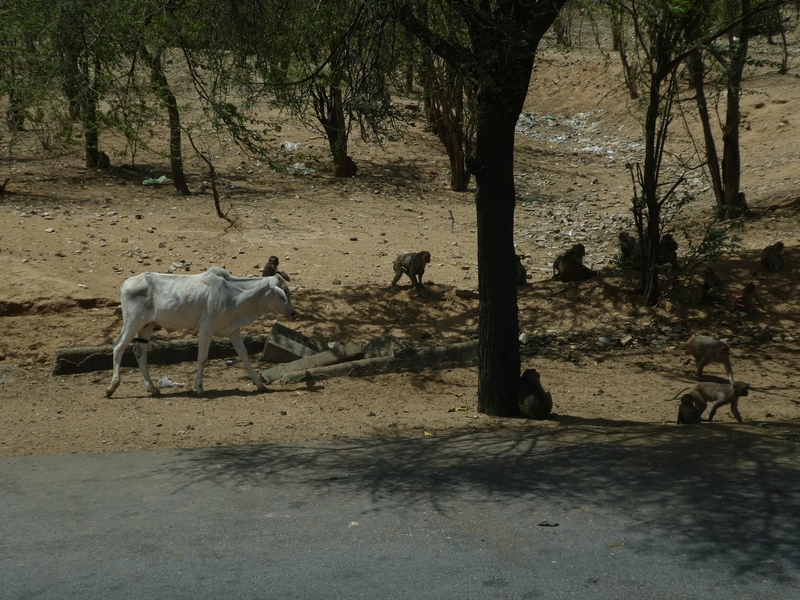 But this is India, and what animal is famous for being on the streets? 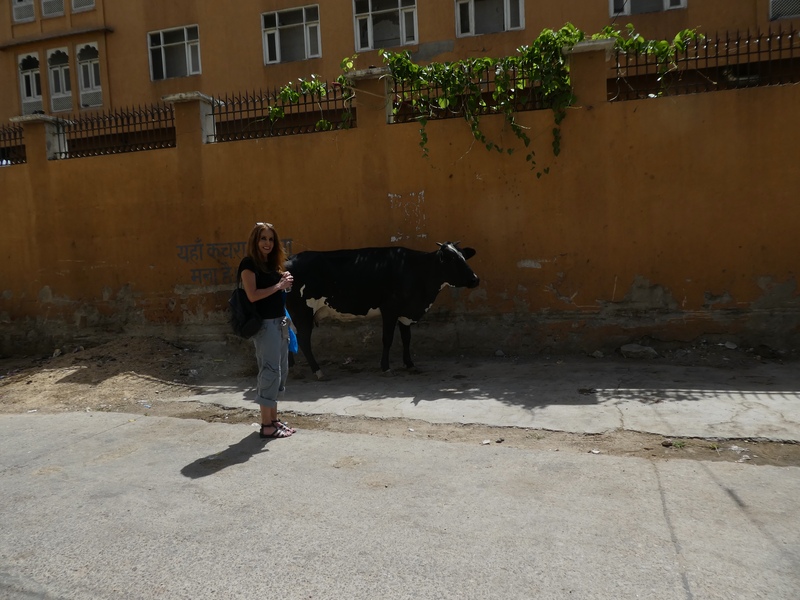 Here behind our hotel, Soapy’s mom is enjoying seeing this cow. The cow is holy, so it is not working. We were walking back from another craft center. We purchased some items of beautiful white marble. Marble from the same mine as the marble for the Taj Mahal. 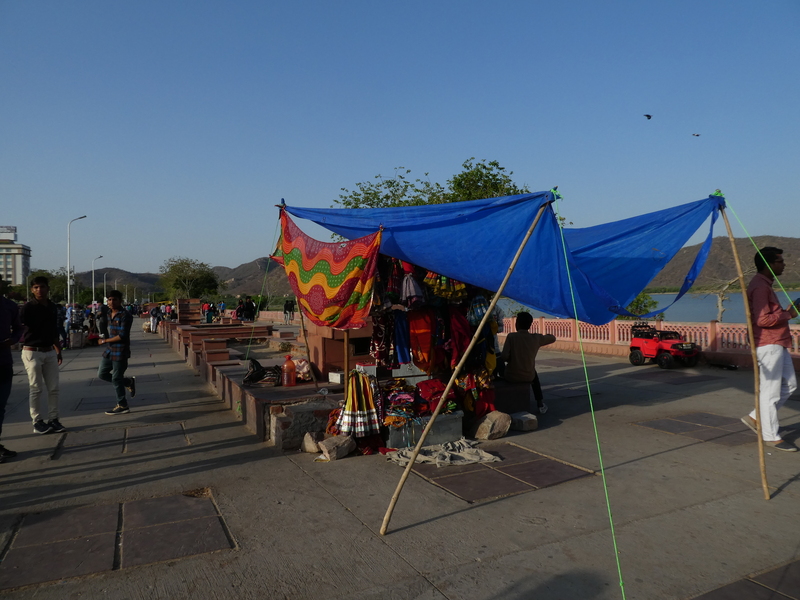 On the edge of town, we stopped at the Amber Fort. 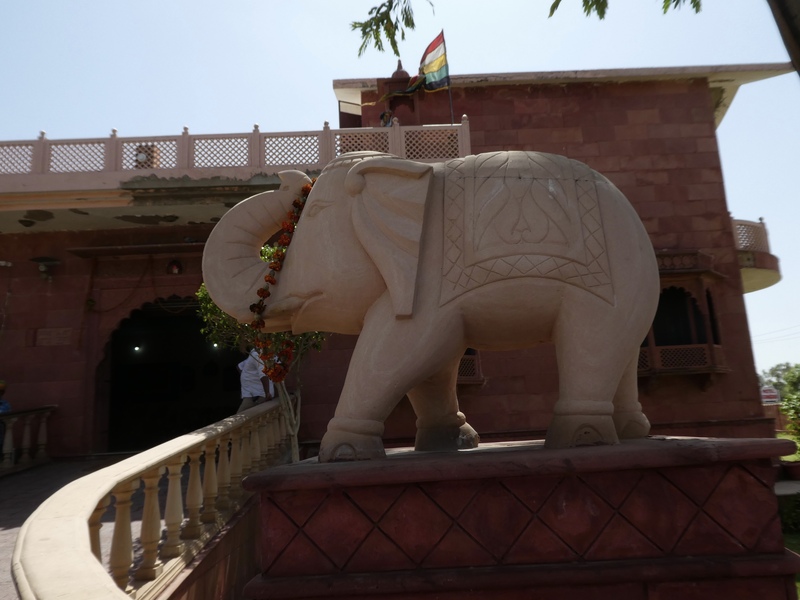 This fort/palace was the ancient capital of Rajasthan. The view from the top is beautiful, with views of the nearby mountains and lake. 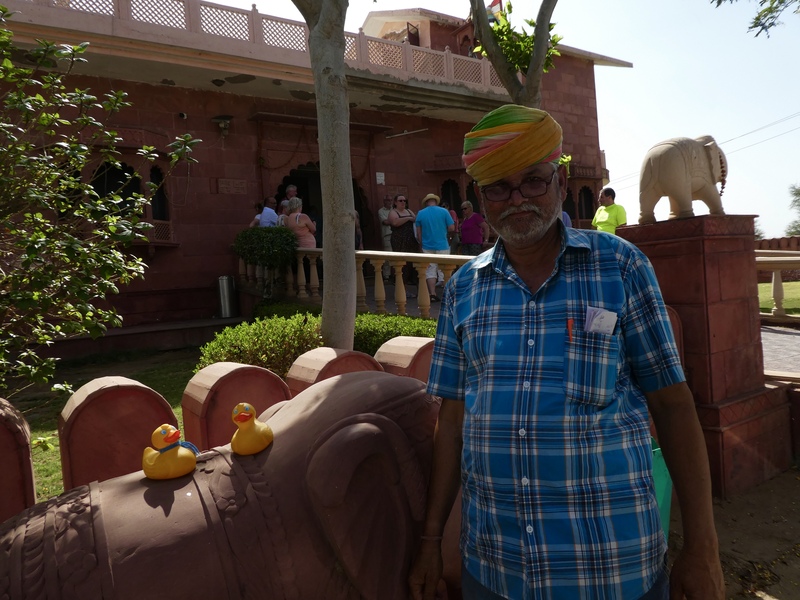 We rode an elephant to the fort. It was summer and it gets hot here in the desert, so the elephants do not work after 11:00 a.m. We were surprised, but we like the elephant so we don’t want him to get too hot and get sick. Unfortunately, this is where we had camera difficulties. So, we will not be able to show the pink facades of old town. Jaipur is known as the Pink City. The market was interesting also. We will see if we can get our camera adjusted. We don’t think it is broken, just needs an adjustment. We really like Jaipur. 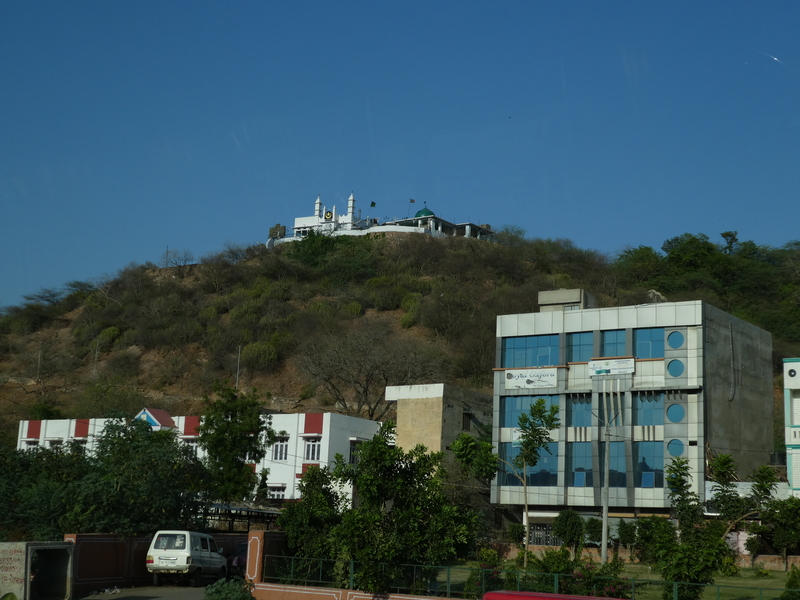 Approaching Jaipur, the capital city of the western, desert state of Rajasthan, India, we see this building on the hill. We do not know what it is, but we thought it was beautiful. So white and impressive. 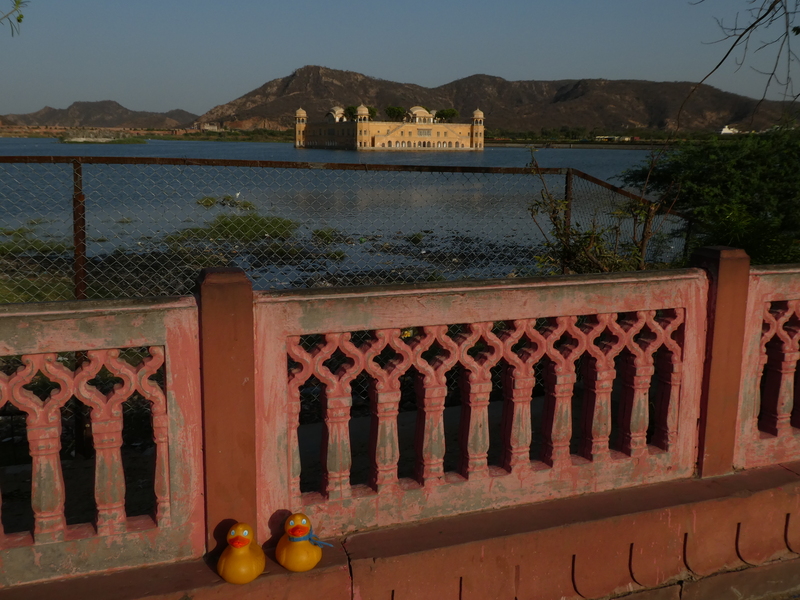 Our first stop, 2.5 miles (4 km) from Jaipur is Jal Mahal. Jal Mahal means ‘water palace”. 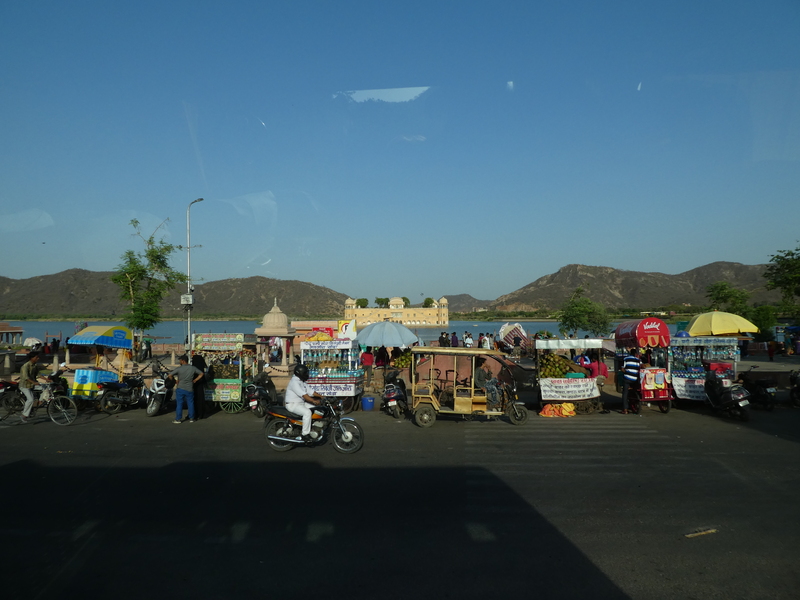 Jal Mahal is in Man Sagar Lake. 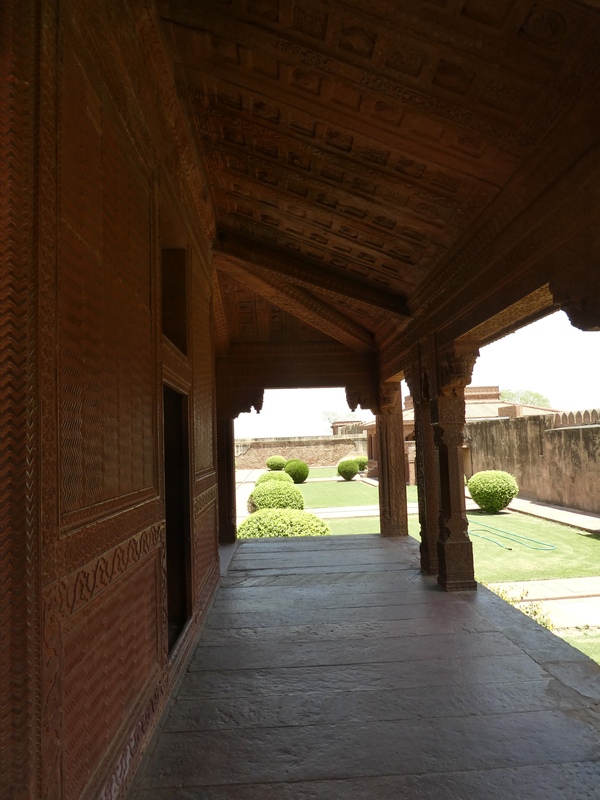 This is Rajput style of architecture. We like this palace. It has 5 stories and with the lake full, 4 stories remain under water. 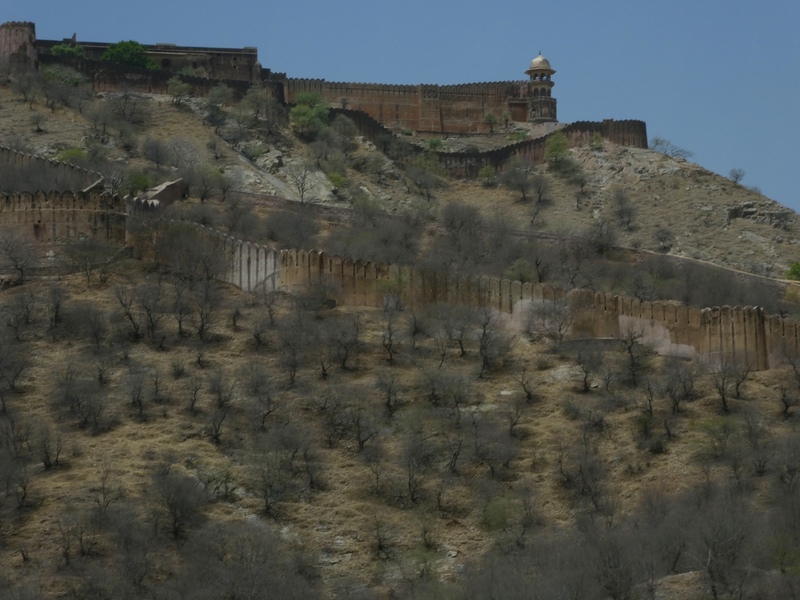 A perfect backdrop is provided by the surrounding Nahargarh hills. Restoration and cleaning of the lake and palace began in 2004. Now there are many venders here. 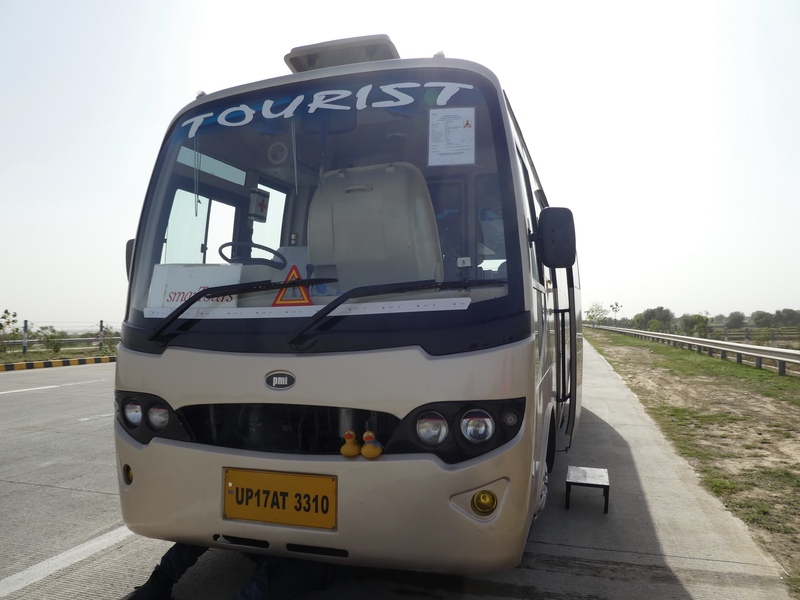 This is a popular with the residents of Jaipur. These ladies have beautiful dresses. Are the bright colors attractive? We like them. This must be a happy place. Venders have balloons. Balloons are for happy occasions. This table of snacks was a puzzle to us. We recognize the tomatoes, but are not sure what the grain type food is. Later in the evening Jesse took us to a nice restaurant where we ate outside. Unfortunately we cannot find the paper with the restaurant name, and we forgot. The food was very good. Of course, Jesse was able to tell us what we were eating, and we liked it. There were entertainers there also. 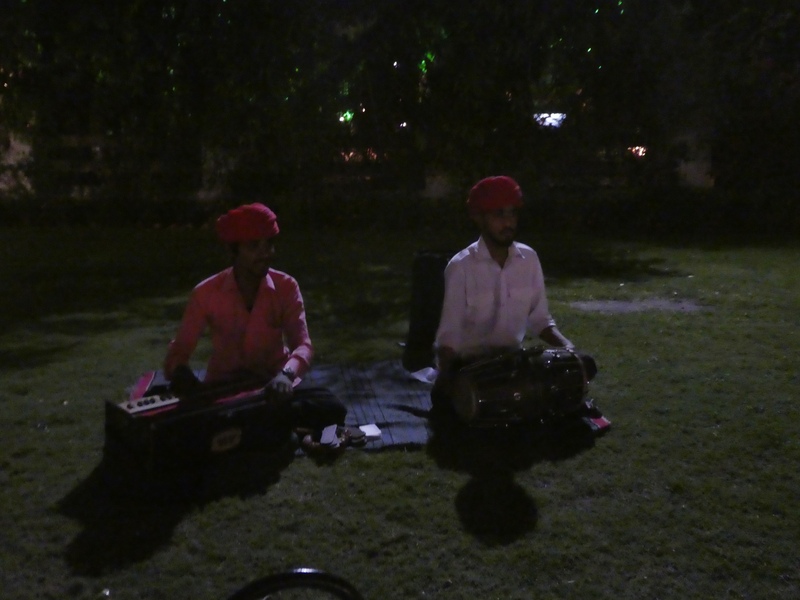 These two men, sitting on the grass, provided music. 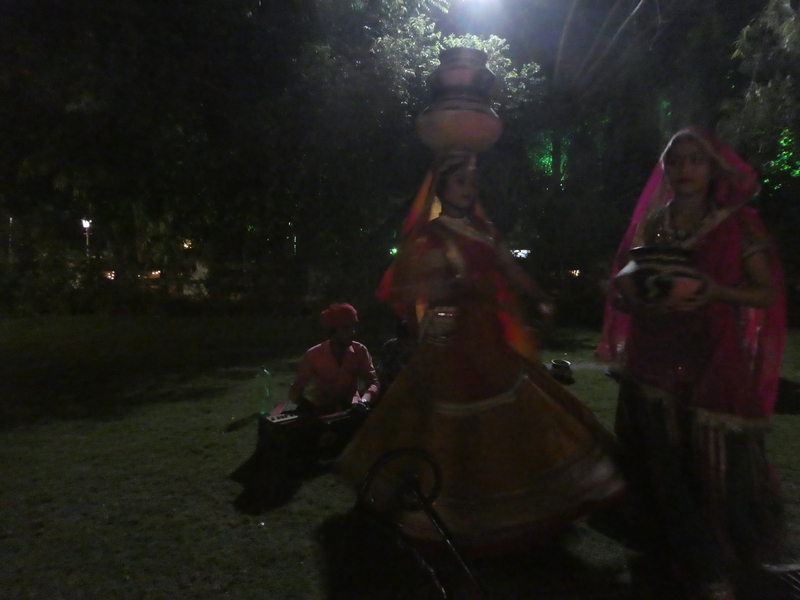 It was suggested that we not take flash photos, especially while the lady was dancing. The flash could be a distraction. New request to us, but it was OK. These photos are dark, because we did not use our flash. 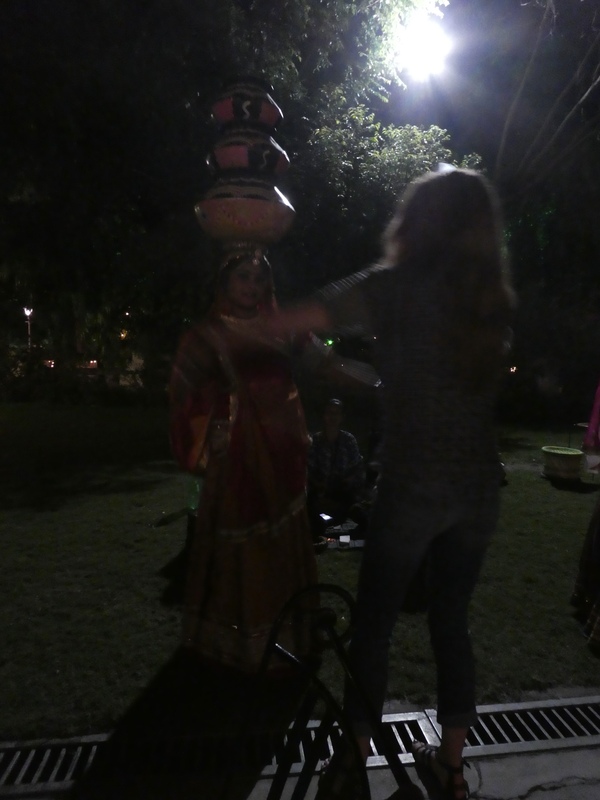 The lady is dancing with two vases on her head. Then she came to our table and asked Soapy’s mom to help her. Soapy’s mom helped with the third vase and then the entertainer and Soapy’s mom did a little dancing. This evening was fun. We were entertained and well fed. 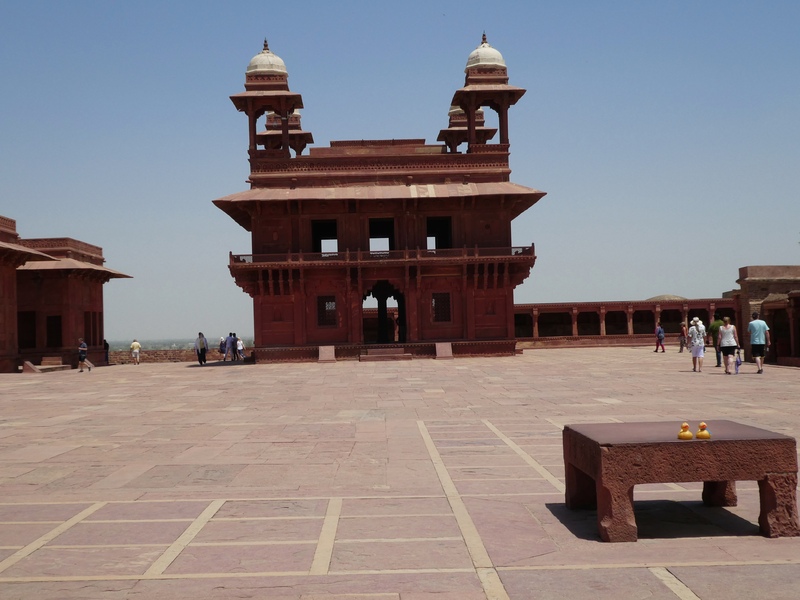 Fatenpur Sikri is an elaborate complex that served as capital of the Mughal Empire for only 16 years. 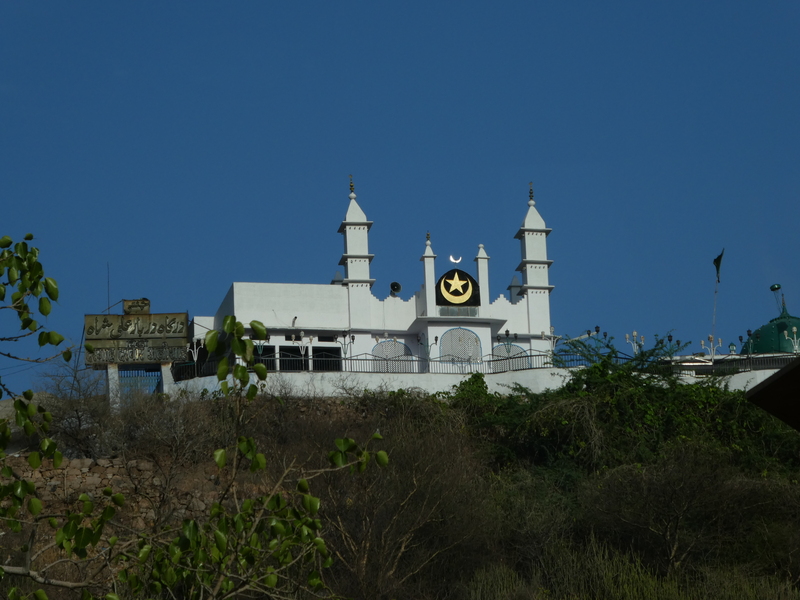 Emperor Akbar visited this area to consult the Sufi saint, Shaikh Salim Chishti, who predicted the birth of his heir. When the prophecy came true, Emperor Akbar built his new capital here. He included three palaces, one for each of his favorite wives. One wife was a Muslim, one wife a Hindu, and one wife a Christian. Let’s enter this complex. After entering the gate, but before the main complex, ruins are visible. Emperor Akbar reigned from this capital for only 16 years, from 1570 to 1586. 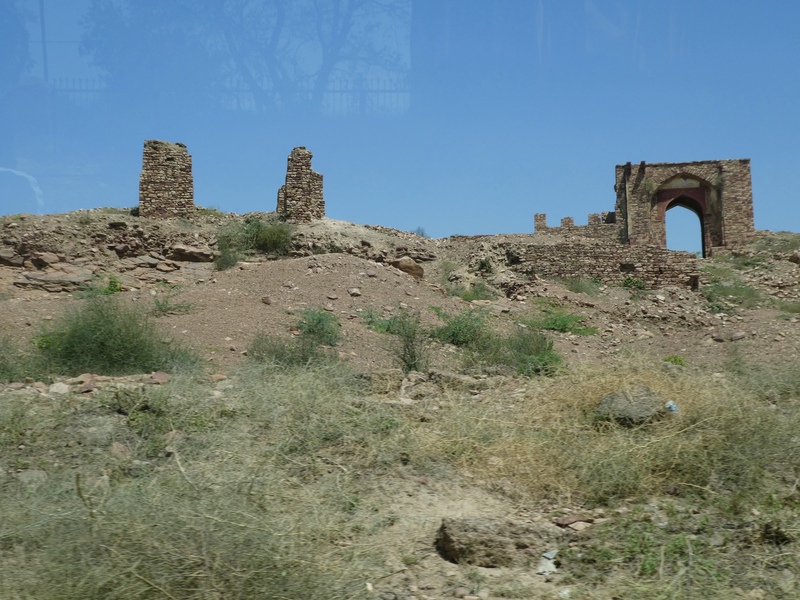 It is believed this city was abandoned shortly after Akbar’s death, due to water shortages. The first building is Diwan i Am, the hall of public audiences. The lawn is beautiful. We were told and also read in our guidebook, that justice here was served quickly. If someone did something that resulted in the death penalty, it was quick. Elephants would trample the guilty one to death. Sometimes, the guilty person laid down and the elephant crushed his head. Maybe we ducks are glad we do not have elephants in our home town. 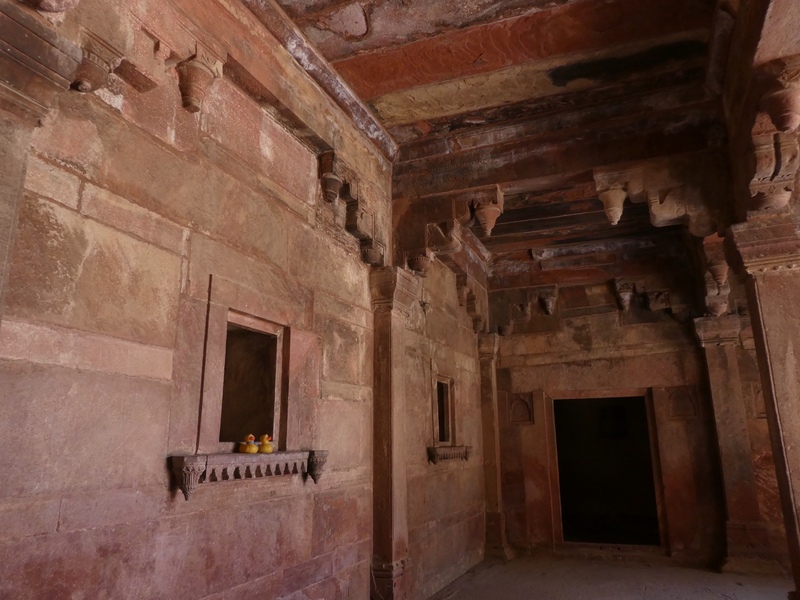 Inside Diwan i Khas, we admired great detail on the central stone column. 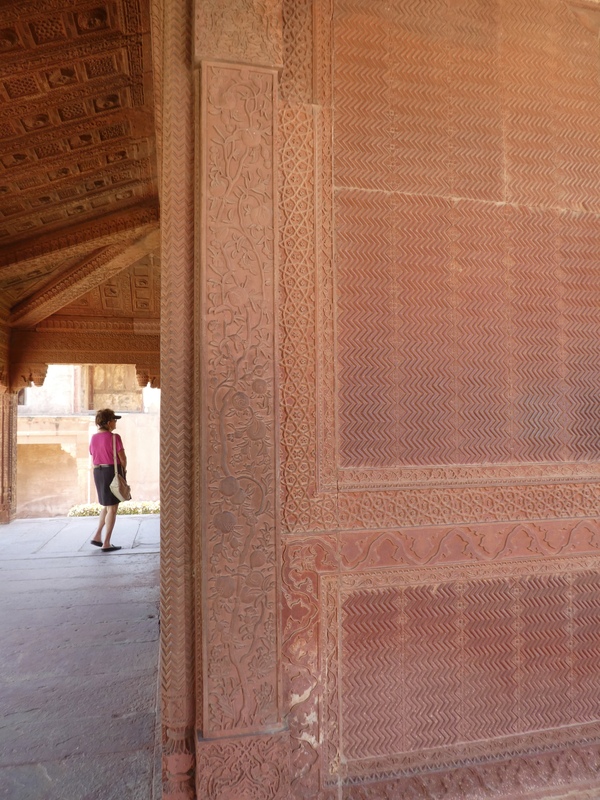 We have noticed and appreciated the beautiful craftsmanship through our visit to India. Every detail is intricate. Wandering around the grounds, we found, or more accurately, we were found by the photographers. Here Soapy Smith’s mom is holding another building. We like the photographers. 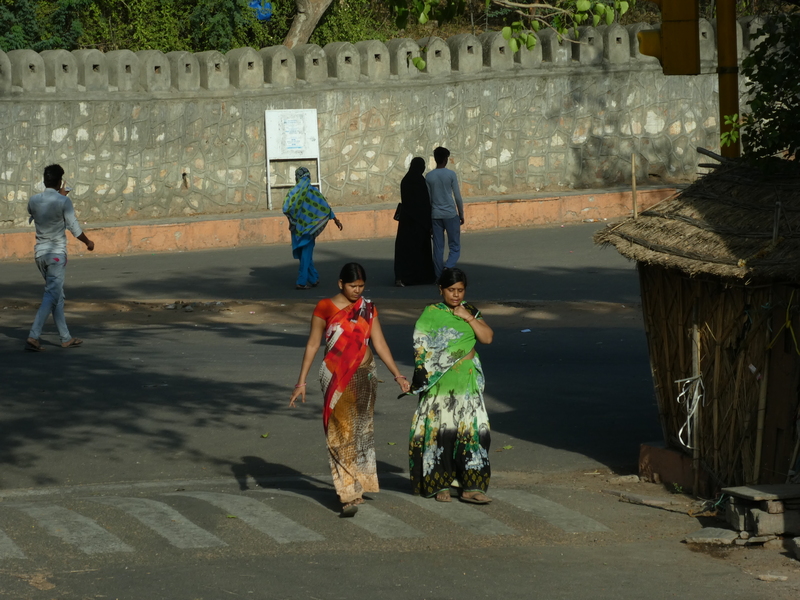 They are trying to earn a living, and we get great photos and memories of our time in India. There are a few of this size building. Maybe buildings for a favorite wife? We don’t remember everything we were told, but we admire the architecture. Here is another example of much attention to detail. Isn’t this door fabulous? Buildings were constructed with the hot summer in mind. This hall provides a cool location and much needed shade. We like this sculpture. We are not sure what it symbolizes and we cannot find information in our guide books. Here we are, sitting on the windowsill, enjoying the shade and marveling that all these huge buildings and complexes were built without any machinery. Today, every construction site has a large variety of heavy equipment and safety equipment for the projects. 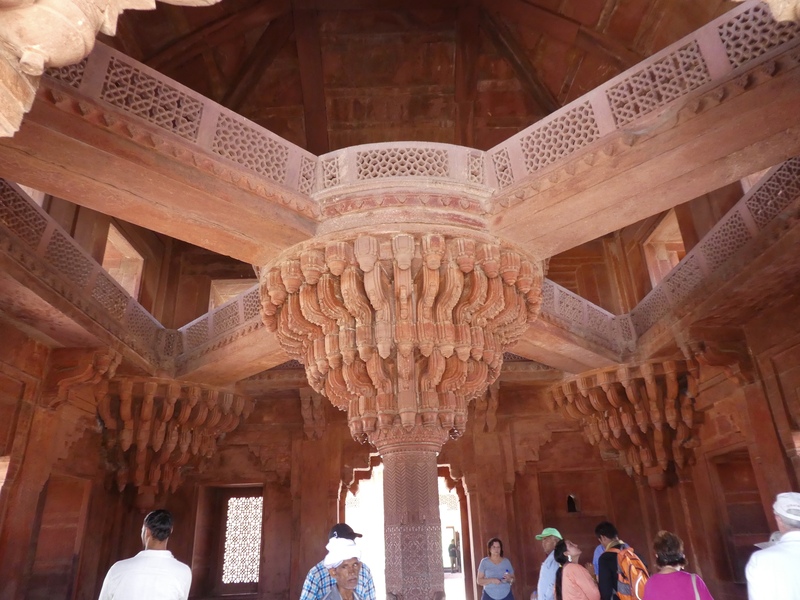 We hope you enjoyed a quick overview of Fatenpur Sikri. 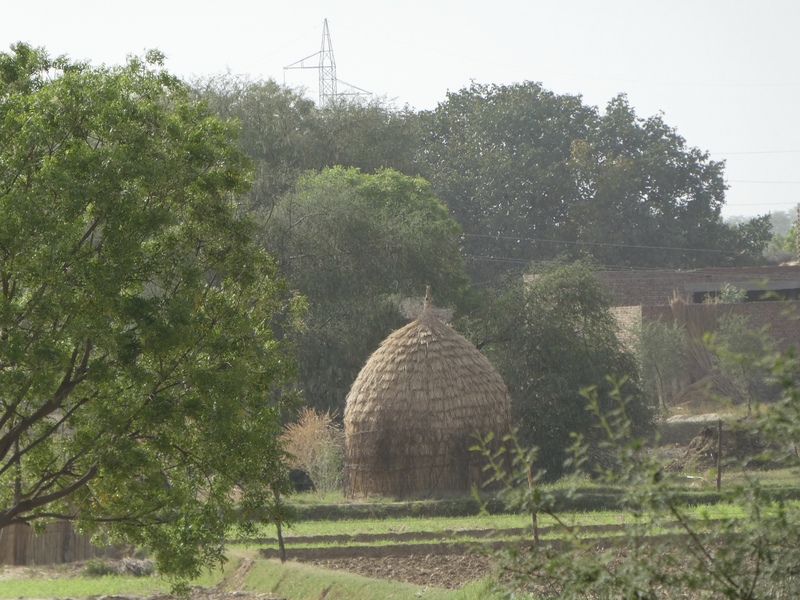 This site is only 40 km (about 25 miles) west of Agra. 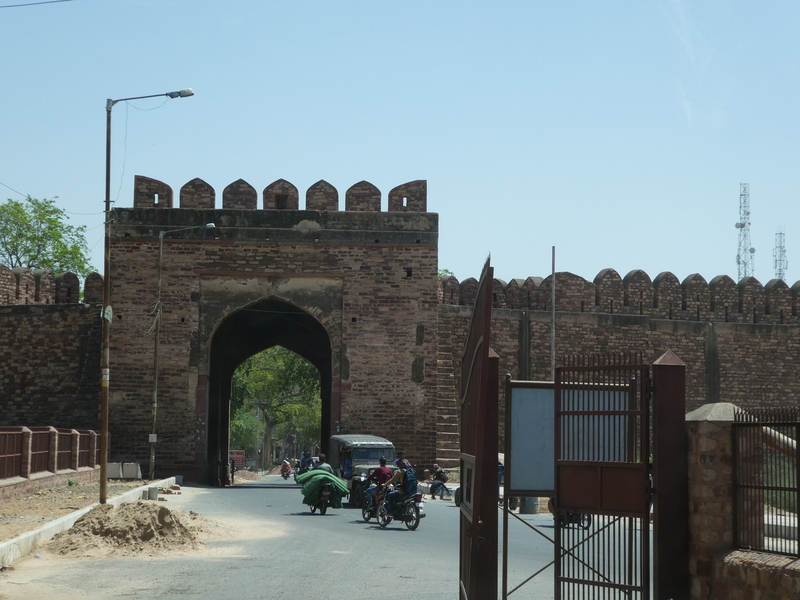 We enjoyed seeing this former capital of the Mughal Empire.